Firstly, we would love to send our great thanks to you for purchasing Palazzo. This documentation covers almost everything to guide you step by step from the start to have your site on air. We encourage you to read thoroughly all sections before you go on. Noo_Theme: Includes noo-palazzo.zip and noo-palazzo-child.zip file that consists of everything you need to install the theme. Document Folder: Includes Palazzo Documentation file that helps you get to know about Palazzo and guides you to build your site with our theme. Release_logs file: Includes the licensing files of ThemeForest purchase. Demo Content Folder: Includes the .xml file and Revolution Slider sample data which you will need to import our demo data. There are two ways to install theme. It belongs to the way you choose your preference. 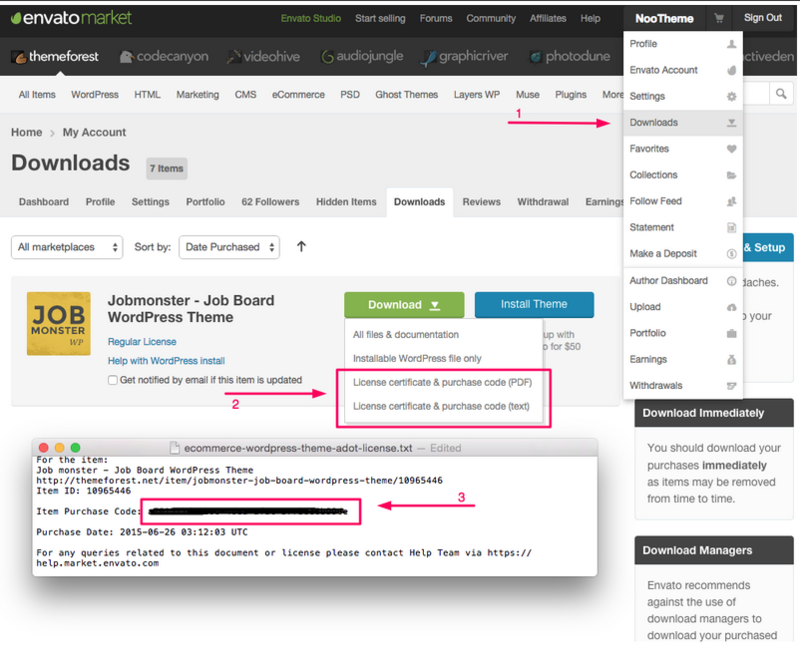 Step 2: Click Install Themes on the top > hit Upload button. Step 4: Once uploaded, activate the theme. Go to Appearance > Themes and activate it. 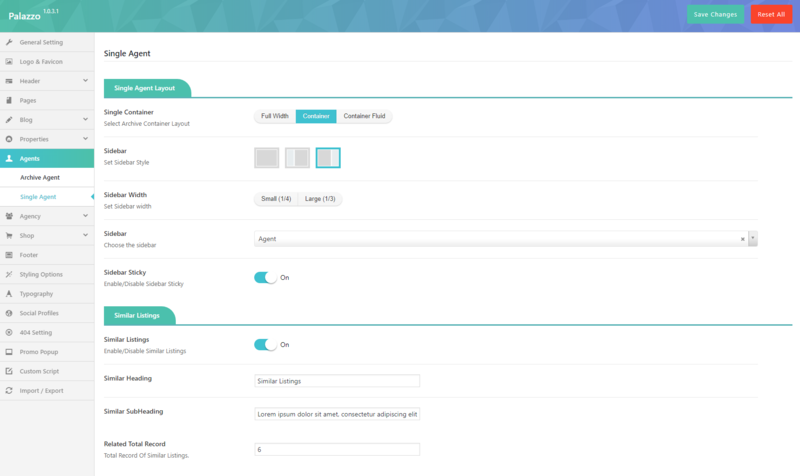 Step 6: Then you will see a notification message to activate the required & recommended plugins: Contact Form 7, Revolution Slider, WPBakery Visual Composer, etc. Follow the steps to install and activate each plugin. Note: If you see this message “Are You Sure You Want To Do This” when installing noo-palazzo.zip file via WordPress, it means that you have an upload max file size limit. Please try to read this blog to find a solution for your website. Palazzo > Dashboard > Purchase Code Verify: Enter the code in ThemeForest Purchase Code. Step 3: Palazzo > Dashboard > Purchase Code Verify: Enter the code in ThemeForest Purchase Code. Step 2: Unzip the noo-Palazzo.zip file and ONLY use the extracted noo-palazzo theme folder. Step 3: Upload the extracted Palazzo Theme folder into wp-content/ themes folder. Step 5: Then you will see a notification message to activate the required & recommended plugins Contact Form 7, Revolution Slider, WPBakery Visual Compose, etc. Follow the steps to install and activate each plugin. Slider Revolution: Slider Revolution - Premium responsive slider. Realty Portal Plugin & Add-ons: Help you separately manage all functions of Real Estate site . 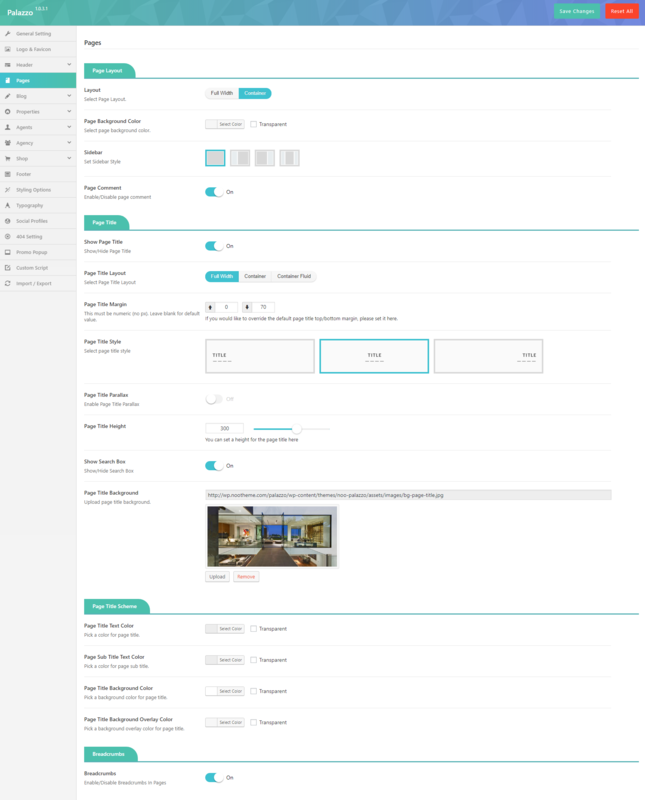 WPBakery Visual Composer: Drag and drop page builder for WordPress. Take full control over your WordPress site, build any layout you can imagine – no programming knowledge required. Noo Palazzo Framework:The Noo Palazzo Framework plugin. The easiest way to import our demo content is to use our Demo Content Importer. Our importer will give you all pages and posts, several sample sliders, widgets, and more. Step 1: Make sure that you have installed and activated our theme & all plugins before importing. Step 3: It can take a few minutes to import everything. Please be patient and wait to complete. Once it loads, you will see a Success message below the tabs. Step 4:All are done, you will have a website like our demo site. Step 1: Go to Dashboard > Tools > Import. Step 3: Click Choose File to upload (.xml) file. Step 1: Go to Dashboard > Revolution Slider > Click > Import Slider. 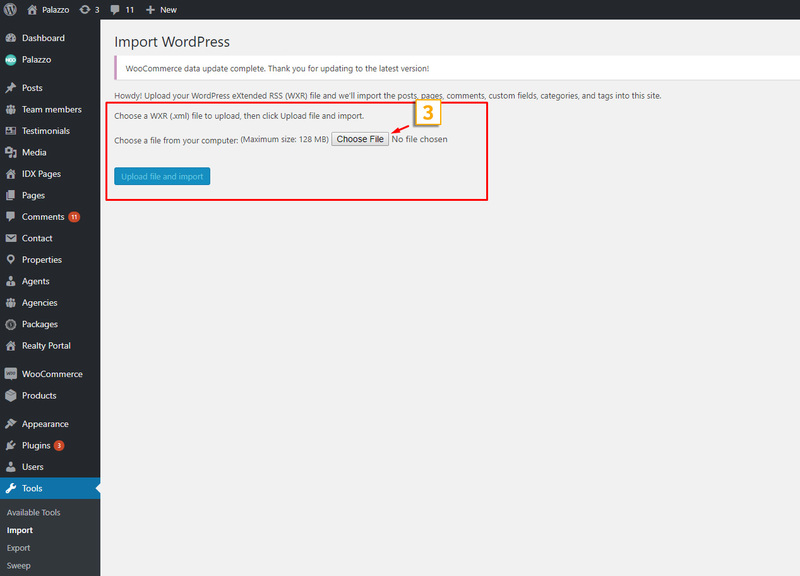 Step 3: Click Import Slider to import a slider on your site. Step 1: Go to Dashboard > Updates . You will see the update version list. Step 2: Check the update list and select the latest version. Step 3: Click Update Themes button. Done! 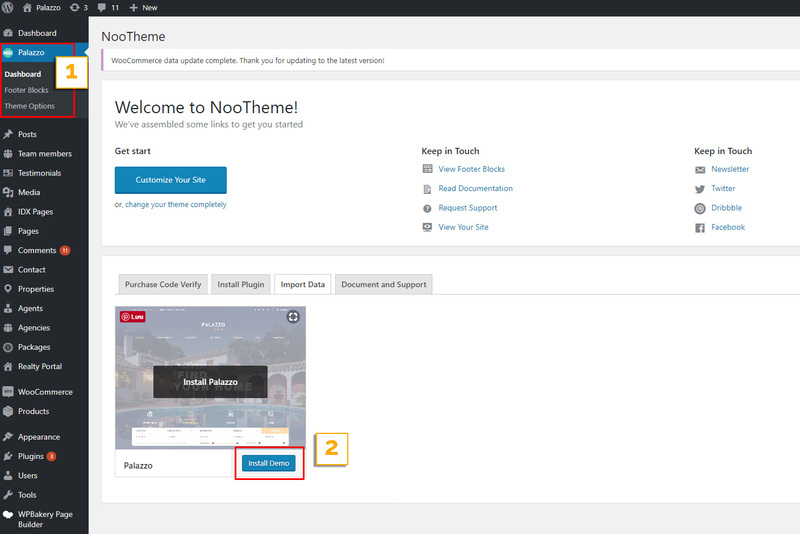 Step 2: Deactivate current theme by going to Appearance > Themes and activate any other themes such as the Default WordPress 4.x Twenty Fourteen. It’s because some basic settings are needed on WordPress site. If you know where the issue is and how to fix it, please skip this section. 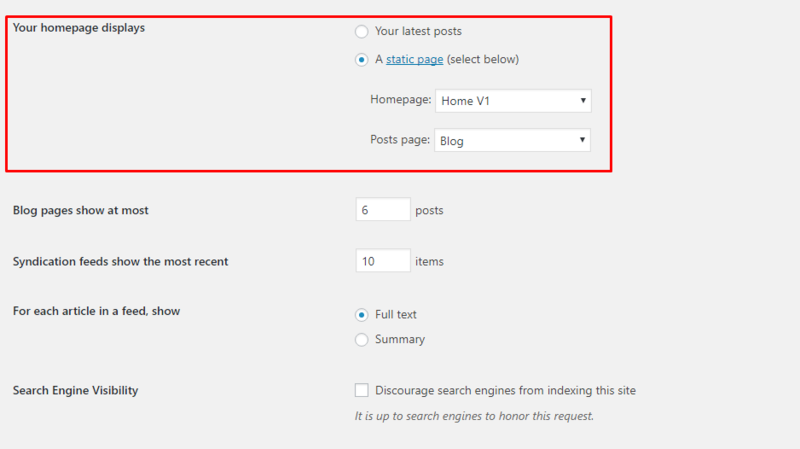 Step 3: In addition, you can choose the number of posts on Blog pages show at most option. Step 4: Click Save to save configuration. Please go to Appearance > Menus, then find Menu Settings > Theme Locations at the bottom. Check the Primary Menu, then save it. This action will assign the menu “Main Menu” to the location Primary (the main menu) on our theme. Please go to Permalinks setting: Settings >Permalinks, then change the Common settings to Post name. You can see more details at:http://codex.wordpress.org/Using_Permalinks. After these steps are done, your site will look like our demo, you can move on to process to build your content. 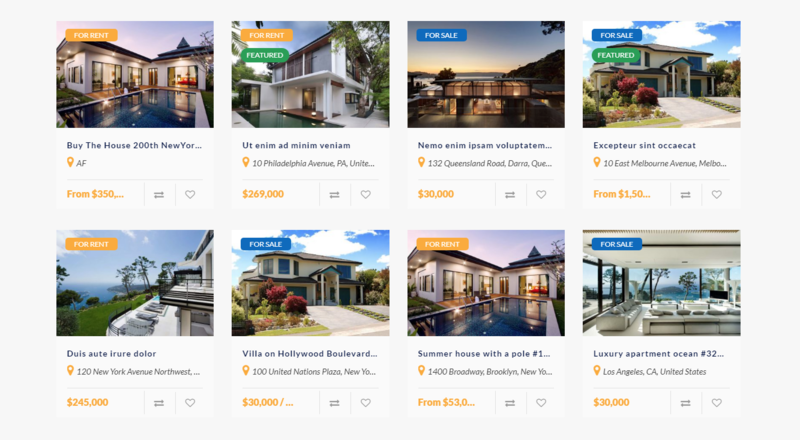 Realty Portal is an amazing plugin that allows realtors manage all functions (advanced search, submit property, agency, agent, agent dashboard, agent profile, compare, my favorites, etc.) 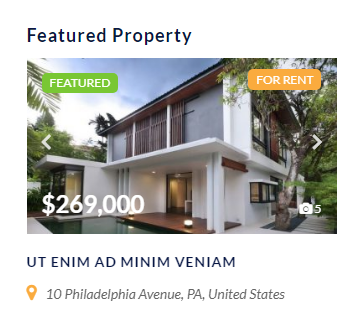 of a real estate site separately through various add-ons. By this way, you can configure your dynamic Real Estate website as you wish by activating or deactivating add-ons coming along with, which is limited by the available themes before..
Quick Setup section allows you to quickly setup all essential pages of your real estate site as property, agents, agency, Advanced Search, Nearby Palaces, Map & Location, Contact & Email, Payment, Email Templates, etc. 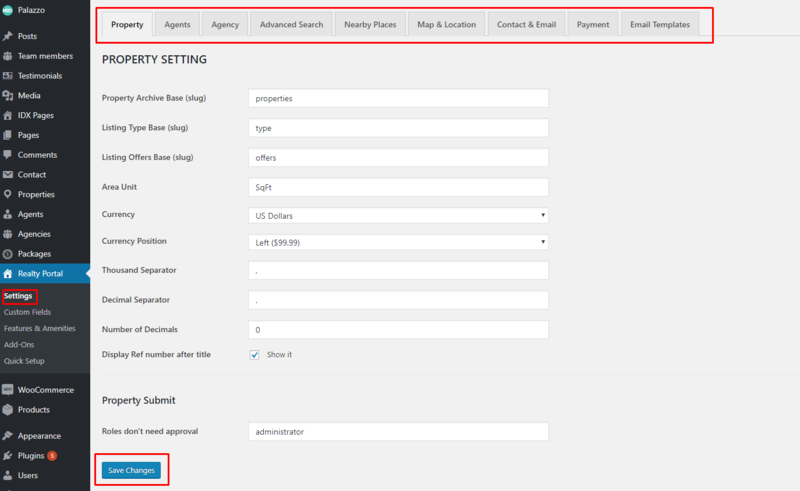 This section allows you to select the style of essential elements of the property, agent, agency and othere parts on the front-end. By this way, you can customize everything evenly the smallest element as a seperator in the price field. Now, follow us to eplore what are amazing things you can do with Realty Portal. .
Property Archive Base (slug): Enter the slug of property archive page. Area Unit: Enter the suitable unit for area. Currency: Choose the currency type you wish from the drop-down list. Currency Position: Select the position to display the currency on the property. Decimal Separator: Select the type of the Decimal separator. Number of Decimals: Enter the number of Decimals you wish. Display Ref number after title: Enable/Disable to display Ref number after title. You will make all changes about agent in this section from the agent profile, dashboard, to the way your agent work something like redirect after login, enable freemium membership and lots of agent related things. Agent Archive Base (slug): Enter the essential slug. This option will affect the URL structure on your site. If you made change on it and see an 404 Error, you will have to go to Permalink Settings and click "Save Changes" button for reseting WordClick link structure. Redirects after login: Choose the directing style from the drop-down list. Only Show Agent with Property: Enable/ disable to show agent with property. Saved Search: Choose "save search" from the drop-down list. Request Viewings :Choose "Requesting Viewings" from the drop-down list. Term of Service: Select "Term of Service" from the drop-down list. Agent Dashboard: Select "Agent Dashboard" from the drop-down list. Agent Profile : Select "Agent Profile" from the drop-down list. Membership Type: Check the membership you choose from the list. Enable Freemium Membership: Enable/ disable freemium membership. Payment History Page : Choose "Paymnet History" from the drop-down list. Submit Property: Choose "create a new property" from the drop-down list. My Favorites: Choose :My Favorites" from the drop-down list. General Setting section allows you to configure general functions to help you mange your real estate site as property, agents, agency, Advanced Search, Nearby Palaces, Map & Location, Contact & Email, Payment, Email Templates, etc. Agency Archive Base (slug): Enter the essential slug: agency. This option will affect the URL structure on your site. If you made change on it and see an 404 Error, you will have to go to Permalink Settings and click "Save Changes" button for reseting WordClick link structure. Agency Profile :Select "Agency Profile" from the drop-down list. Page Team Members :Select "Team Members" from the drop-down list. 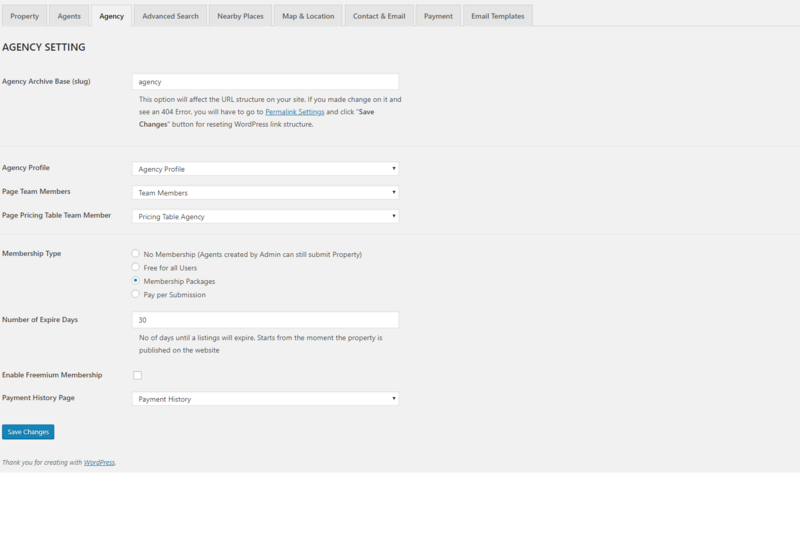 Page Pricing Table Team Member: Select "Pricing Table Agency" from the drop-down list. Membership Type :Check "Membership Packages" from the list. Enable Freemium Membership:Enable/ disable freemium membership. Advanced Search section allows you to set up postions of search fields from 1 to 8 as you expect. Position #2 :Select search field number 2 for advanced search from the drop-down list. Example: Country. Position #3 :Select search field number 3 for advanced search from the drop-down list. Example: City. Position #4 :Select search field number 4 for advanced search from the drop-down list. Example: Offers. Position #5 :Select search field number 5 for advanced search from the drop-down list. Example: Types. Position #6 :Select search field number 6 for advanced search from the drop-down list. Example: Custom Field: Bedrooms. Position #7 :Select search field number 7 for advanced search from the drop-down list. 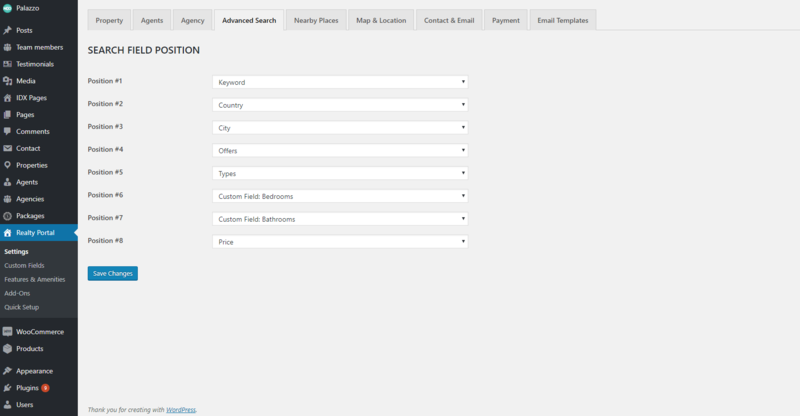 Example: Custom Field: Bathrooms. Position #8 :Select search field number 8 for advanced search from the drop-down list. Example: Prices. 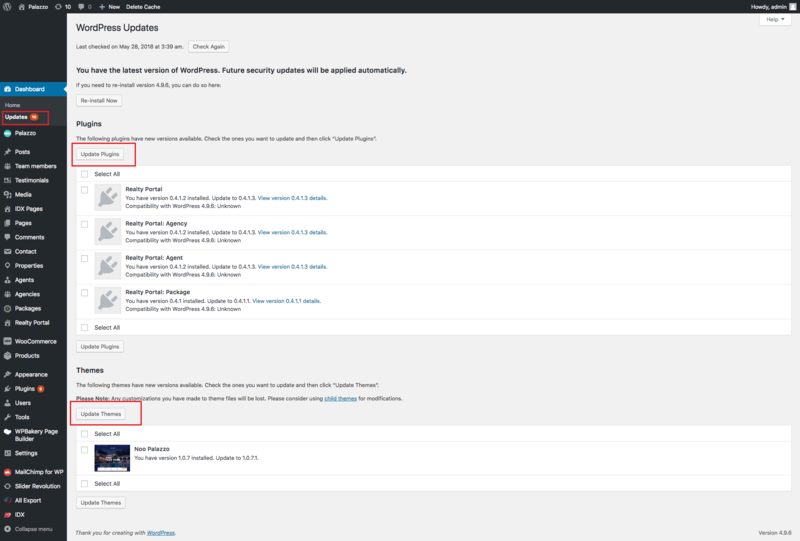 Enable/Disable: Check to choose enable/ disable to show yelp on property detail page. API Key: Enter API key. Show/Hidden: Check to hide or show images Yelp place on property detail page. Distance Unit: Choose the distance unit (Miles, Kilometers) from the drop-down list. Enable/Disable : Choose hide or show Walkscore on property detail page. Walkscore API Key: Enter Walkscore API Key. Note: Walk Score requires that you register an API Key to display Walk Score on from your website. Map & Location section allows you to set up all related location like Google Maps. Latitude, longtitude, Zoom, Location input, etc. Google Maps API: Enter Google Maps API. Google requires that you register an API Key to display Maps on from your website. Starting Point Longitude: Enter the Longtitude. Default Zoom Level: Enter the number of Zoom level. Default Map Height (px): Enter Default Map Height (px). 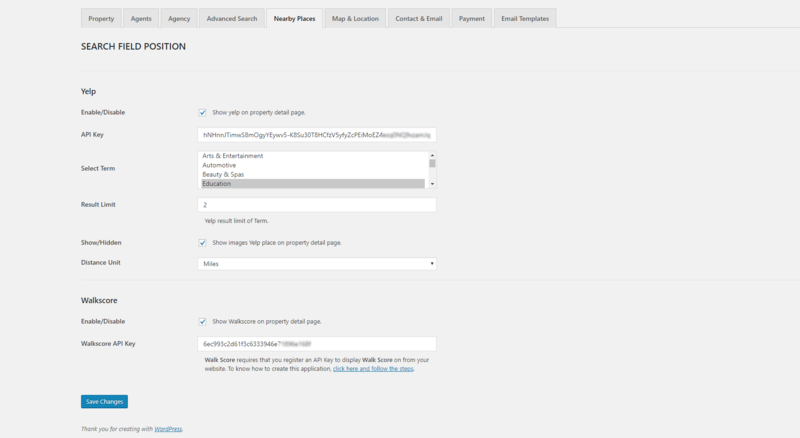 Automatically Fit all Properties: Enable this option and all your listings will fit your map automatically. Show nearby places:Tick this box to show nearby places in map..
Google Map Auto-Complete: Enable/ disable freemium membership. Country Restriction: Choose "Paymnet History" from the drop-down list. Location Type: Choose "create a new property" from the drop-down list. Country: Choose :My Favorites" from the drop-down list. State: Click "save changes" button to save all your settings. City: Enable/ disable freemium membership. Neighborhood: Choose "Paymnet History" from the drop-down list. Zip Code: Choose "create a new property" from the drop-down list. Maps:Choose :My Favorites" from the drop-down list. CC all Property Emails to: Enter the email address which allow you to CC all Property Emails to. 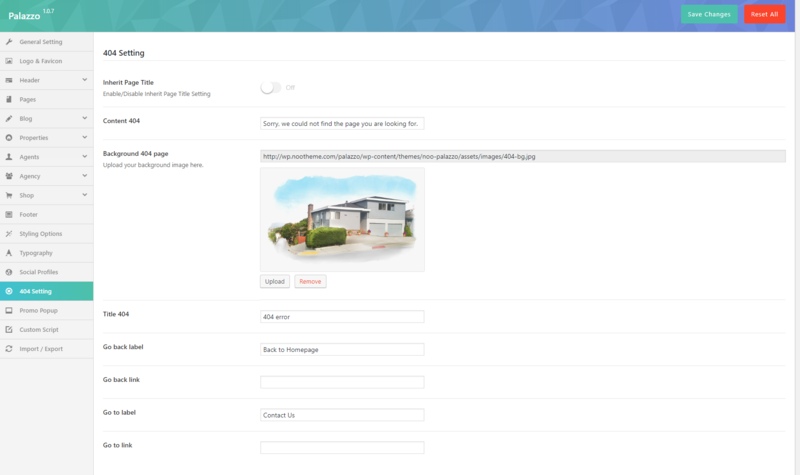 Custom Property Contact Form: Select a form you created with Contact Form 7 plugin to use for contact and send email on Property page from the drop-down list. 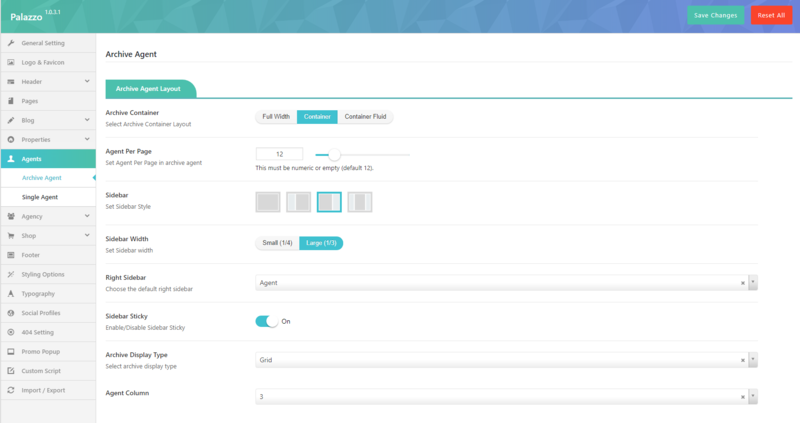 Custom Agent Contact Form: Select a form you created with Contact Form 7 plugin to use for contact and send email on agent profile page from the drop-down list. Paypal: Customers can directly pay for the selected package through Paypal . WooCommerce: Or customers can use payment methods that WooCommerce offers like Visa, Master cards, etc. Submit Property part in email templates section allow you to set up an email to notify customers when they submit a property. Subject needs approval: Enter the Subject you use before approval. Content needs approval:Enter the Content that include the link to click for the approval. Active:Tick the box to active the email. Active:Tick the box to active. Active:Tick the box to active the notification email. Content:Enter the content following the available smaple. Active:Tick the box to active the email to inform for a payment submission complete. Subject Type Publish Listing:Enter the subject of publish listing. Content Type Publish Listing: Enter the content of publish listing. Subject Type Upgrade to Featured:Enter the subject of upgrade to featured type. Content Type Upgrade to Featured: Enter the content of upgrade to featured type..
Subject Type Publish Listing with Featured:Enter the subject of publish listing with featured type. Content Type Publish Listing with Featured: Enter the content of publish listing with featured type. Subject: Enter the subject of agent email. Content:Enter the content of agent email. Active: Tick the box to active the admin panel. Subject: Enter the subject of the admin panel. Active: Tick the box to active agent email. Subject: Enter the subject of the agent email. Content:Enter the content of the agent email. Save Changes:Click "save changes" button to save all your settings. 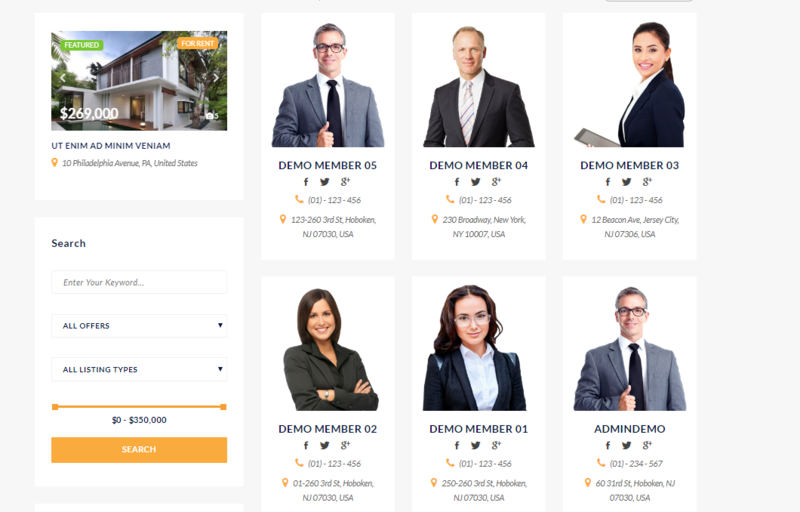 This section allows users to smoothly manage property, agent, agency by offering specific custom fields for property, agent, agency, property buy. So, you can change, delete or add new fields following your aim. Property section allows you to set up everything around property like size, rooms, area, floor, structure, etc. Agents section allows you to set up Everything around Agenst field like position, email, phone, mobile, skype, profile, etc. 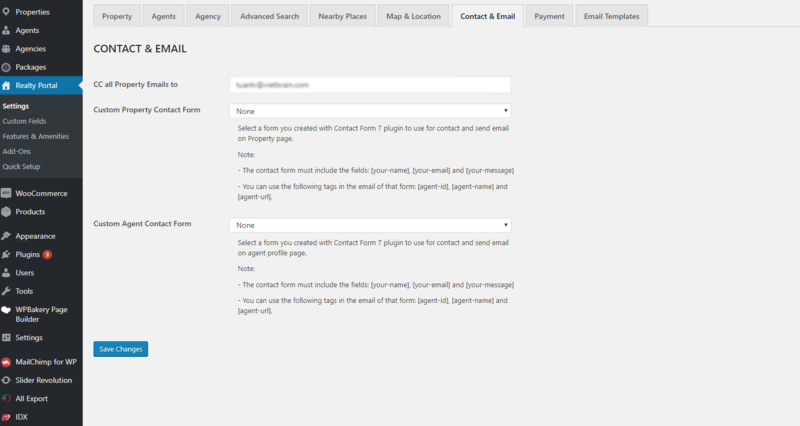 Agency section allows you to set up everything you need in the agency page like phone, mobile, email, skype, address, etc. Property Buy section allows you to set up all essential information for a property for buy. Features and Amenities allows you to create or delete features and amenities that you wish to display on each property. 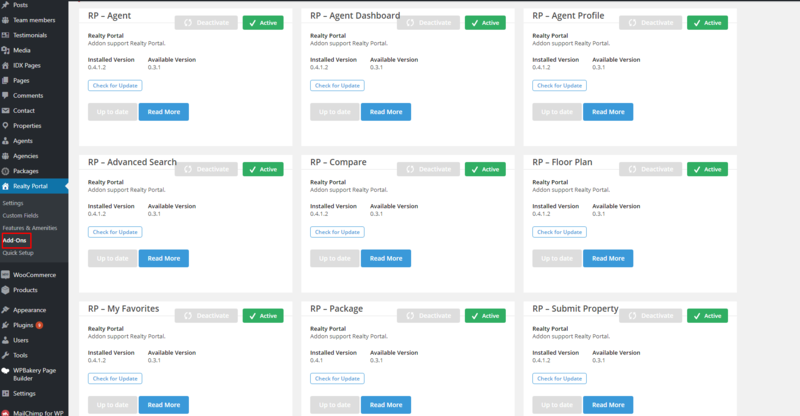 Realty Portal helps realtors easily and quickly manage all functions of a real estate site through various add-ons included RP - Agent, RP - Agent Dashboard, RP – Agent Profile, RP – Advanced Search, RP – Compare, RP – Floor Plan, RP – My Favorites, RP – Package, RP – Submit Property, & RP – Nearby Places. 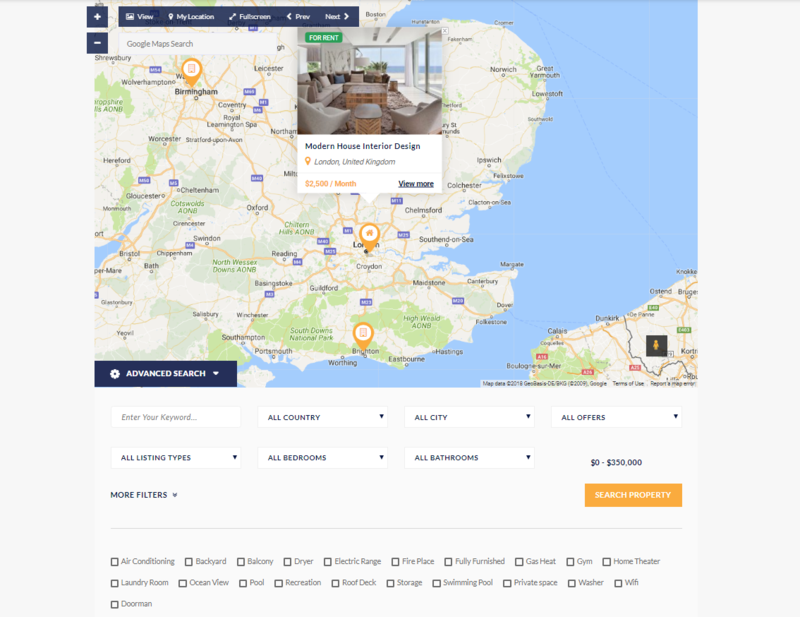 Properties section allows you to add new property with fully information that a property needs, as well as set up listing types, listing offers, Location, Request Viewing, Properties for buy. Agencies section is made to help realtors and real estate offices easily manage their companies and their agents. Relaty Portal allows you to create your agency page with the understandable form. 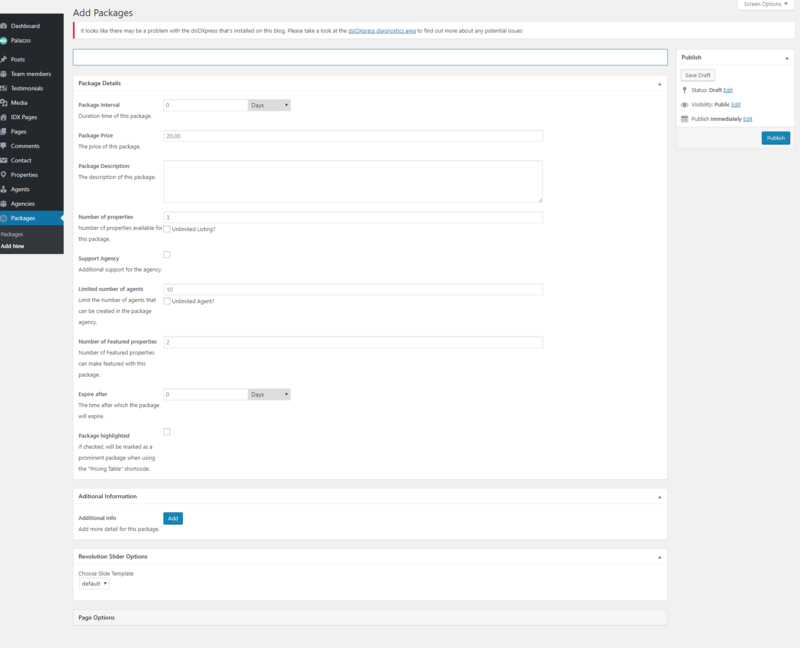 Packages section allows users to set up expected packages which are more suitable for their aim. The add-on manages your Membership type. You can add more information for your package instead of available info. 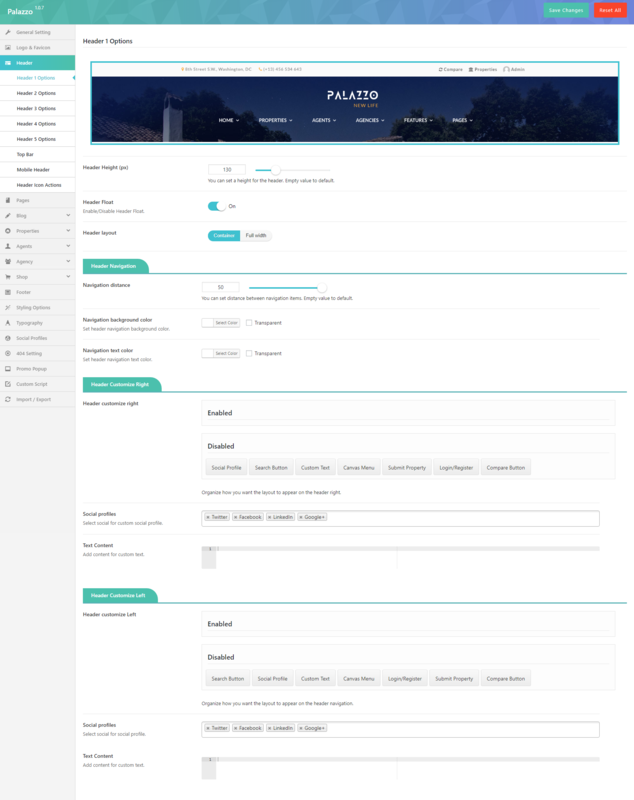 Based on Redux Framework, Palazzo provides Theme Options helping users easily to control WordPress theme. 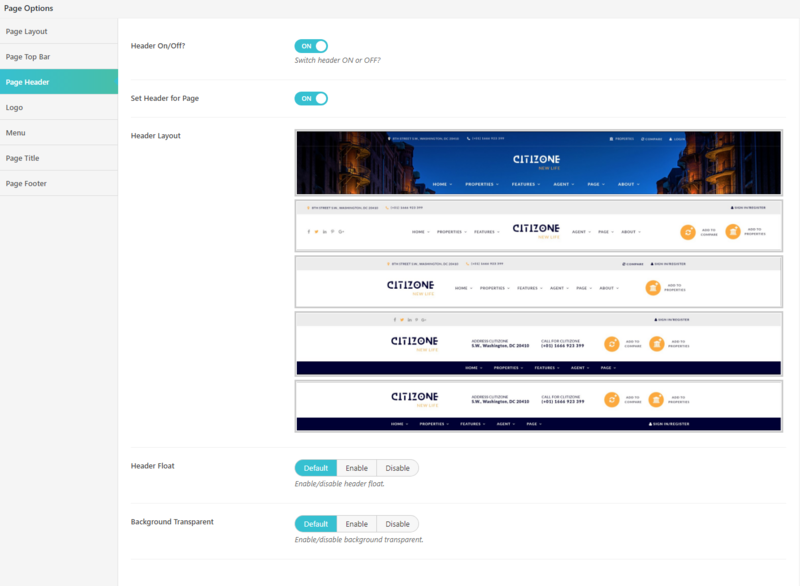 There are many options in Theme Options, each option has a mission to make your website nicer and more eye-catching.You absolutely go to Palazzo> Appearance> Theme Options to see all options. And do not forget to follow this section to see description of each option in Theme Options. General Setting section allows you to configure general pages such as select page preloader or configure enhancement or 404 page. Page Preloader: Select Page Preloader for your website. Leave empty if you don't want to use. When selecting one page preloader type,you need to select Preloader background color and Preloader spinner color for your website. Back To Top: Turn On/Offback to top button. Layout Style: Select layout style for your website including Boxed, Wide and Float style. If selecting Boxed style, you need to configure Site Width(%), Site Max Width(px), Body Background Mode and Body Background for your website. Google API Key: Set google API Key for Map. Social Share: Show the social sharing in blog posts, product. In this section, you can upload your logo, sticky logo and custom favico for your WordPress website. Logo: Upload your logo from your computer or select on Media Library. Retina Logo: Upload your retina logo from your computer or select on Media Library. Logo Max Height: You can set max-height for logo here. Logo Padding: Enter the number of padding-top, padding-right, padding-bottom and padding-left for your logo. Sticky Logo: Upload sticky logo on this option. Sticky Retina Logo: Upload sticky retina logo on this option. Header layout: Select a header layout option from the examples. Sub Menu Animation: Select animation for sub menu. Sub menu scheme: Set sub menu scheme. Sub Menu Background Color: et Sub Menu Background Color. Sub Menu Text Color: Set Sub Menu Text Color. Header Sticky: On/Off header sticky. Header Sticky Effect: Select the effect for the header sticky. Header Sticky Scheme: Select header sticky scheme for your header including Inherit, Gray, Light, Dark. Header Height (px):You can set a height for the header. Empty value to default. Navigation distance:You can set distance between navigation items. Empty value to default. 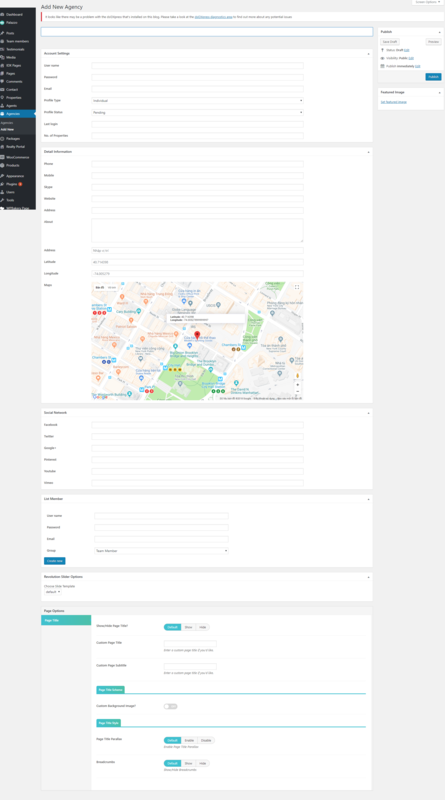 Navigation background color:Set header navigation background color. Navigation text color:Set header navigation text color. Header customize right:Organize how you want the layout to appear on the header right. Social profiles:Select social for custom social profile. Text Content:Add content for custom text. Header customize navigation:Organize how you want the layout to appear on the header navigation. Social profiles: Select social for social profile. Show/Hide Top Bar: Show Hide Top Bar on your website. Top bar Padding left/right (px): Set the padding left/right. Top Bar Background Color: Set Top Bar background color. Top Bar Text Color: Pick a text color for the Top Bar. Top bar Layout Column: Select the top bar column layout. Top Left Sidebar: Choose the default top left sidebar. Top Right Sidebar: Choose the default top right sidebar. Top Bar Register Link: Enable/disable top bar register link. Header Layout: Select header mobile layout. Menu Drop Type: Set menu drop type for mobile header. Mobile Logo: Upload your logo here. Top Bar: Enable Top bar. Stick Mobile Header: Enable Stick Mobile Header. Search Box: Enable Search Box. Shopping Cart: Enable Shopping Cart. Search Box Type:Select search box type. Post Type For Ajax Search: Select post type for ajax search. Amount Of Search Result: This must be numeric (no px) or empty (default: 8). Mini Cart Style: Set hover/click type for cart icon action. Mini Cart Button: Select mini cart button action. 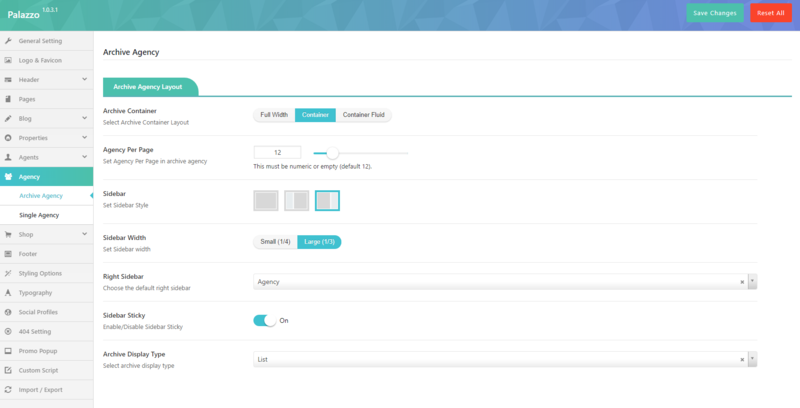 Wishlist Fly Canvas: Enable wishlist Fly canvas style. Login/Register Popup effect:Select effect for popup login/register form. Background Overlay Color : Set Background color for Popup Login/Register form. 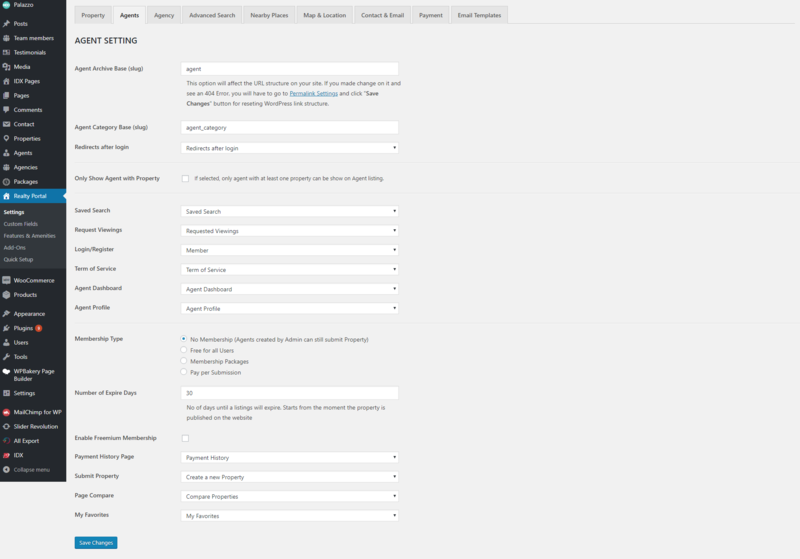 Page Setting section will help you to configure page default on your WordPress site. Layout : Select Page Layout. Page Background Color :Select page background color. Page Comment : Enable/Disable page comment. Show Page Title :Show/Hide Page Title. Page Title Layout :Select Page Title Layout. Page Title Margin :This must be numeric (no px). Leave blank for default value. Page Title Background : Upload page title background. Page Title Text Color :Pick a color for page title. Page Sub Title Text Color : Pick a color for page sub title. Page Title Background Color :Pick a background color for page title. Page Title Background Overlay Color :Pick a background overlay color for page title. Layout : Select page layout for single blog including FullWidth, Container and Container Fluid. Sidebar: Select sidebar style for single blog page including Left, Right, No-Sidebar, Left and Right sidebar. Sidebar Width: Select the width of sidebar for single blog page. You can choose Small(1/4) or Large(1/3) for your single blog page. Left Sidebar: Choose the default of left sidebar from drop down sidebar list. 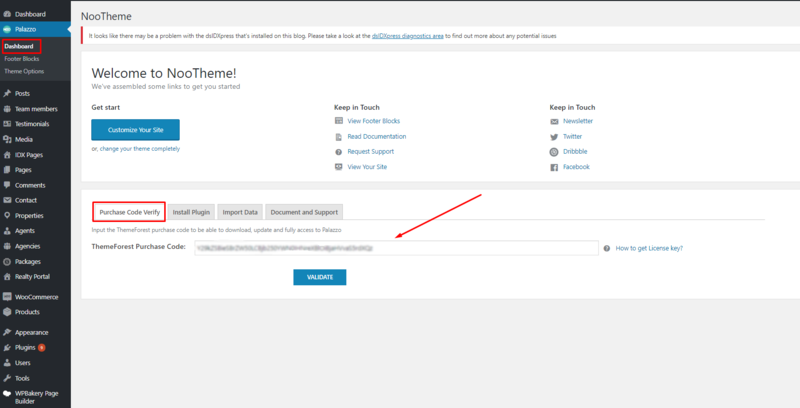 Single Blog section allows you to configure single blog page. For example: layout, sidebar, etc. Layout: Select page layout for single blog including FullWidth, Container and Container Fluid. Show Post Navigation: Turn On/Off post navigation for your single blog post. Show Author Info: Turn On/Off author for single blog page. Social Share: Show the social sharing in blog posts. Related Layout: Select related layout. Related Total Record: Total Record Of Related Post. Custom Single Blog Title : Enter a custom page title if you would like. Single Blog Title Background : Upload single blog title background. Archive Container : Select Archive Container Layout FullWidth, Container and Container Fluid. Property Per Page: Set Property Per Page in archive properties. Sidebar: Set Property Per Page in archive properties. Sidebar Width: Set Sidebar Style. Right Sidebar: Choose the default of right sidebar from drop down sidebar list. Sidebar Sticky : Enable/Disable Sidebar Sticky. Archive Display Type :Select archive display type. Single Container : Select Archive Container LayoutFullWidth, Container and Container Fluid. Sidebar Style: Select sidebar style for single blog page including Left, Right, No-Sidebar, Left and Right sidebar. Sidebar: Choose the default of sidebar from drop down sidebar list. Sidebar Sticky :Enable/Disable Sidebar Sticky. Style Gallery :Select style for gallery. 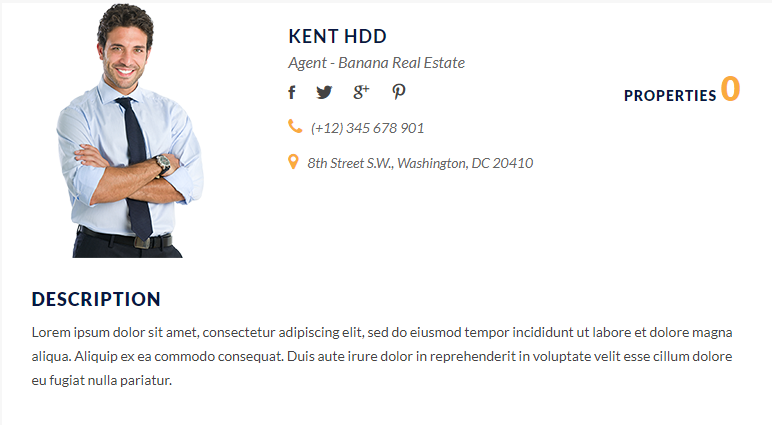 Single Property Elements:Custom element for the Single Property page details. Similar Listings : Enable/Disable Similar Listings. Similar Heading: Text the similar heading. Similar SubHeading: Text similar subheading. Related Total Record: Total Record Of Similar Listings. Print Property Elements : Custom element for the print property page details. Select what are enabled and disabled. Archive Container : Select Archive Container LayoutFullWidth, Container and Container Fluid. Agent Per Page: Set Agent Per Page in archive agent. Right Sidebar: Choose the default right sidebar from drop down sidebar list. 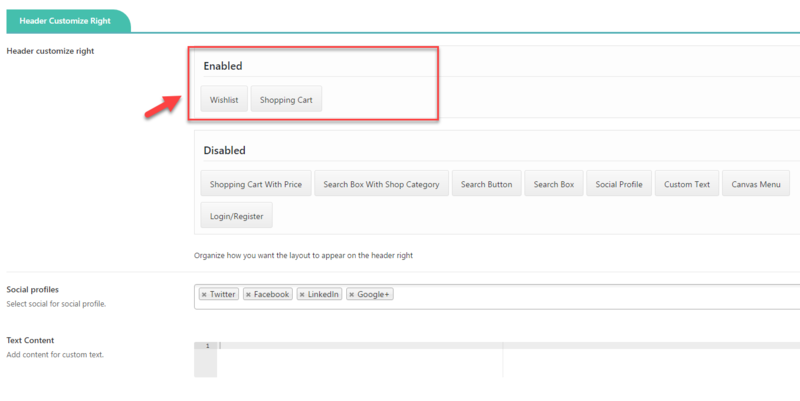 Show Page Shop Content :Enable/Disable Shop Page Content. Product Display Columns :Choose the number of columns to display on shop/category pages. Related Product Total Record : Total Record Of Related Product. Related Product Display Columns :Choose the number of columns to display on related product. Single Product Accessories Display Columns : Choose the number of columns to display on accessories product. In this section, you can select Footer Block for your main page. If you change vakue in this section, you must " Sace & Genarate CSS"
Text Color :Set Text Color. Heading Color :Set Heading Color. In this section, you can select Fonts for body, menu, page title, page sub title from dropdown list font. Social Profile section allows you to turn on social media and add the link your account to your website. 404 section allows to configure 404 page by adding title, background image for 404 page. Page Title 404: Enter the page title for 404 page. SubPage Title 404: Enter sub page title for 404 page. Background 404 page: Upload your background image for 404 page. 404 Heading : Enter 404 heading. Go back label: Enter the name of button to go back page you want. Go back link: Enter the link URL which will be redirected if user click "go back label". Show Popup: Turn On/Off popup. Popup Width: You can set the width of popup. Popup Height: You can set the height of popup. Popup Effect: Choose popup effect for popup. Popup Delay: Set the delay of popup(caculate by miliseconds). Popup Content: Enter the content for popup. Popup Background: Select background image for popup. 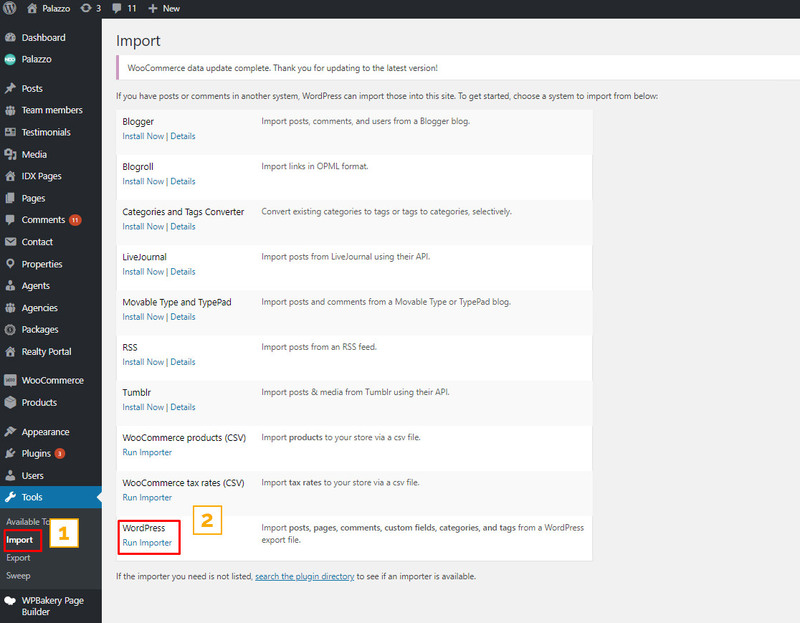 In this section, you can import or export date from your website. 1 - If you want to add a header style to all pages of your website: Please go to Theme Options > Header > Header Layout > Select a header style layout from all header styles. 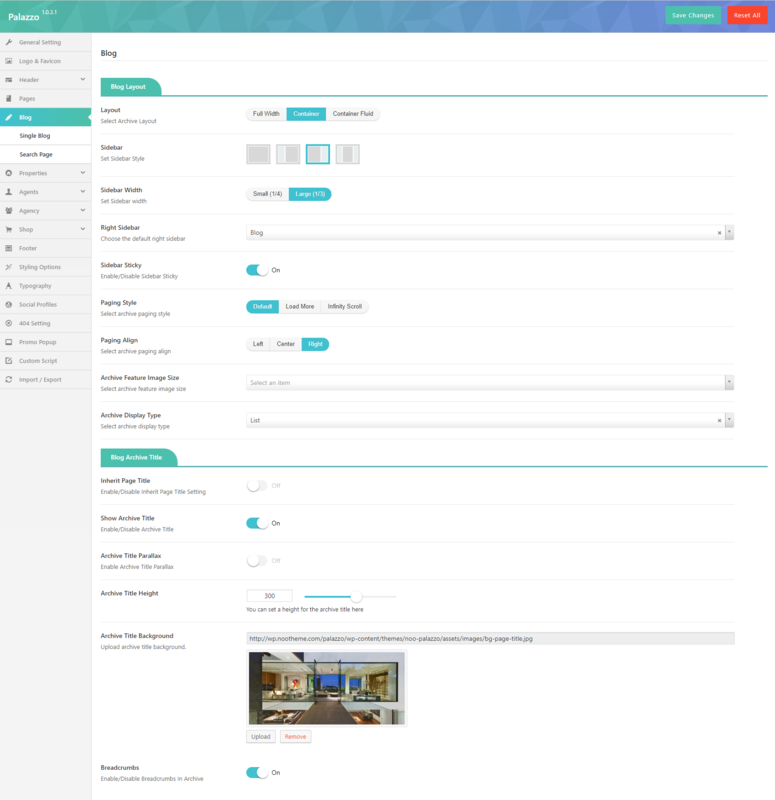 After that, navigate to Theme Options > Header > Header Customize that you selected to configure the elements of Header. This header style will be displayed on all pages. 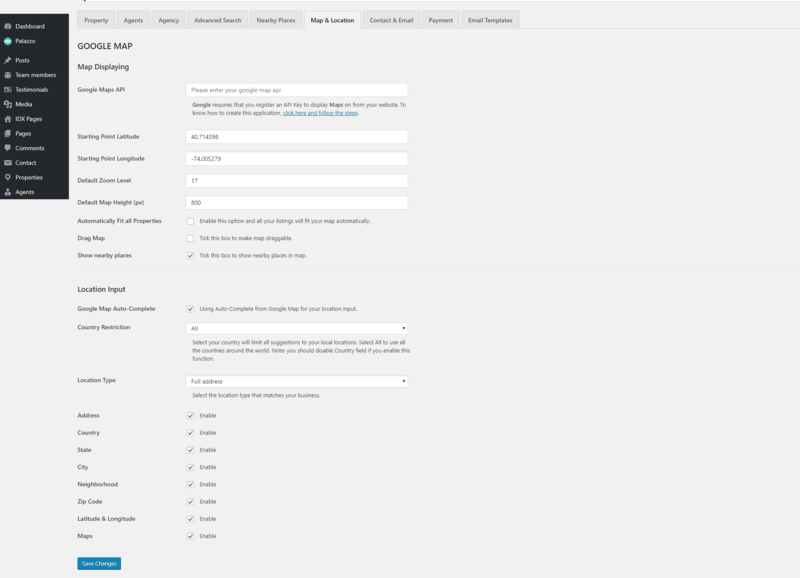 Step 2: Go to Theme Option > Header > Header 2 options > Setup their configure. Primary Menu: This is main navigation located in the header. Split Left: This is main navigation located in the left header. Split Right: This is main navigation located in the right header. Mobile Menu: This is main navigation displayed on mobile device. 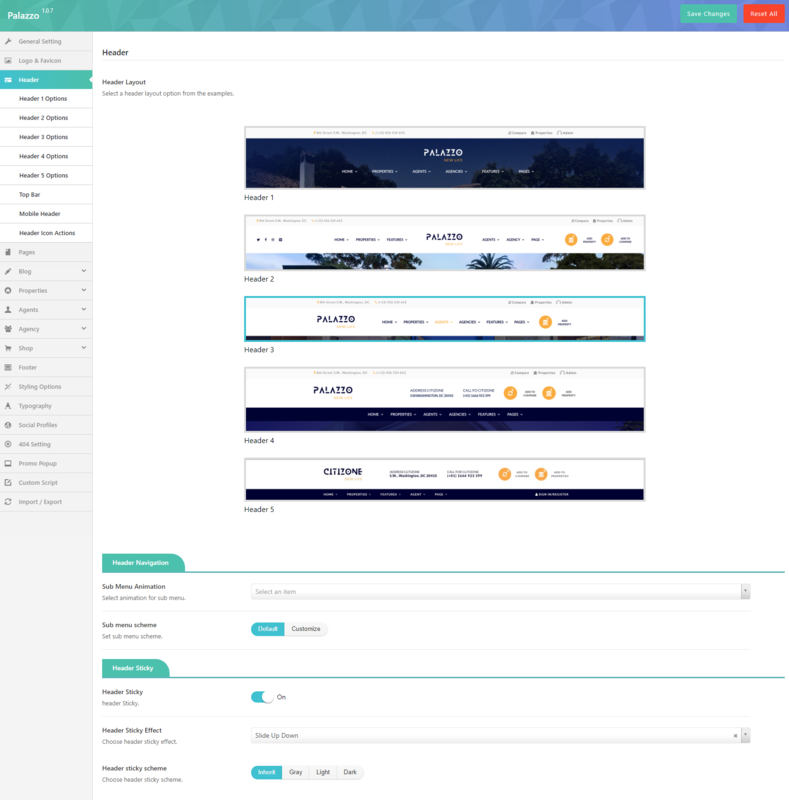 This theme has built-in multi-column menu system. Menus are created by using the core WordPress menu manager. 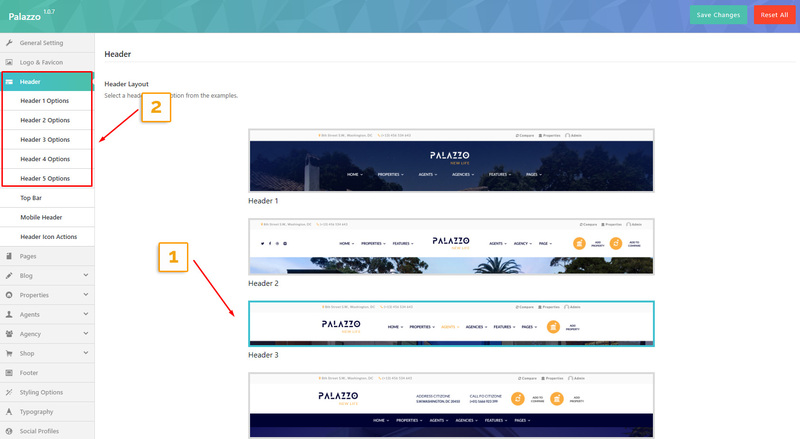 Follow the guide below to learn how to create a new menu on Palazzo theme. Step 1: Navigate to Appearance > Menus from Admin panel. Step 2: Click the Create A New Menu link to make a new menu. Enter the name, then click Create Menu button. Step 3: To add menu item, select pages and posts on the left-hand side and click Add to Menu button. You also can add custom links or post categories into the menu. Step 4: To create a dropdown menu, simply drag a menu item below of another menu item and slide to the right, and it will lock into place and create a dropdown section. 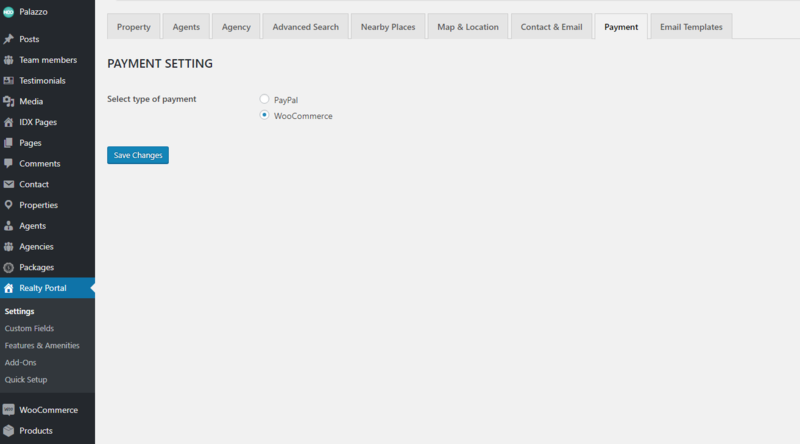 Step 6: After your menu is set up, scroll down to the bottom of the page to assign the menu on the Theme Location box. Step 7: Once it’s all are done, make sure you click the Save Menu button. 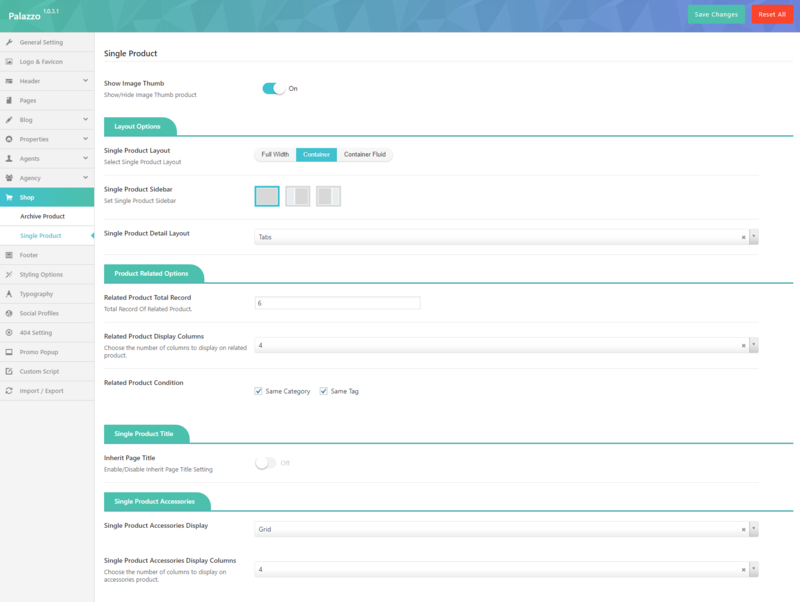 Palazzo supports creating Megamenu for your website. 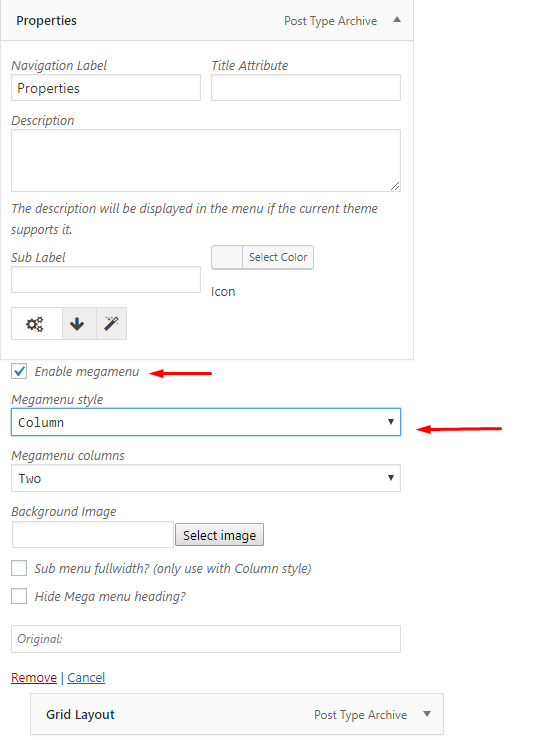 Megamenu contains 2 sub-menu styles: Column and Tab. To easily enable megamenu, you only open Menu Item level 0 > Check Enable megamenu to activate mengamenu. 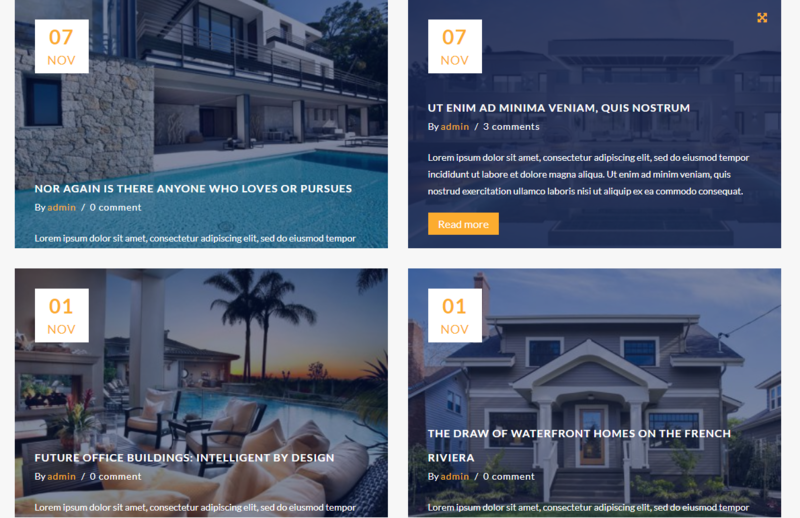 Column Style is a multi-column style menu to display menu items (such as shop, Portfolio). Column Style requires your menu which must have Level 0, Level 1 and Level 2 menu item. 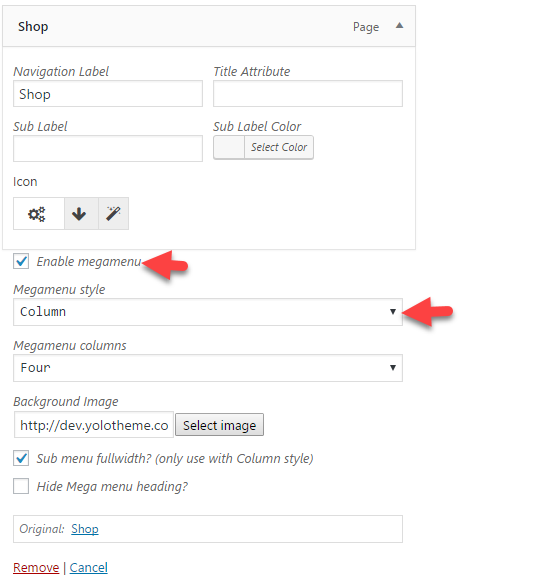 Click a Level 0 menu item and select Megamenu style: Column and select Megamenu columns for your website. Tab Style allows adding many different content types on your menu. On Tab Style, menu only has 2 levels (Level 0, Level 1). 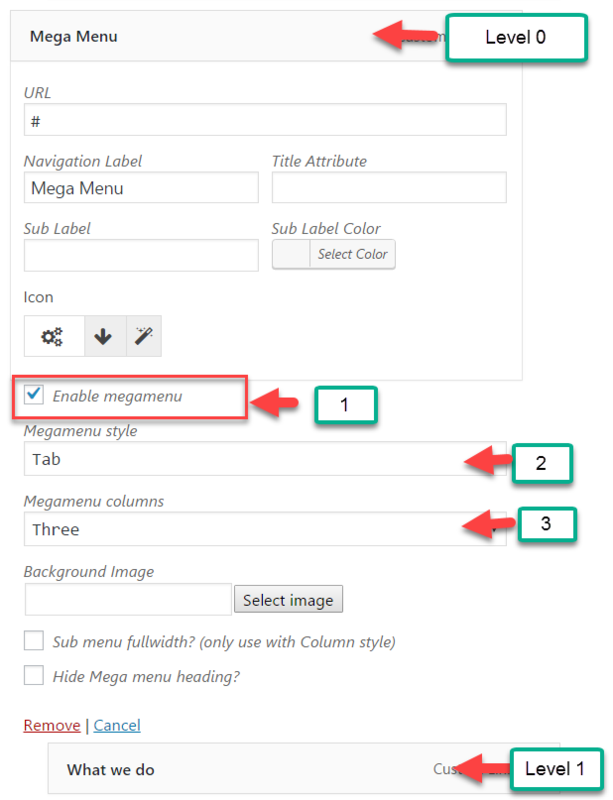 On menu level 0, select Megamenu style: Tab and select Megamenu Columns for your menu. On menu level 1, you need to select Mega Menu widget area (Mega Menu widget area will be defined on Appearance > Widgets). In addition, remember to select Tab Columns from drop down list columns. 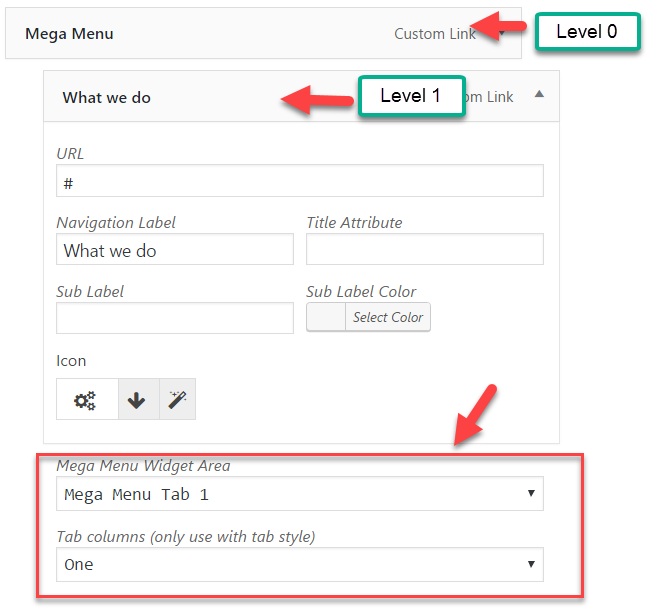 Palazzo supports 3 sidebar positions to add widgets of Mega Menu: Tabs menu. That includes Mega Menu Tab 1, Mega Menu Tab 2 and Mega Menu Tab 3. Step 1:From Admin Panel, navigate to Pages > Add New to create a new page. Step 2: Enter the title, slug and content for your page.You can choose to add your content using Visual Composer shortcode or Text editor. Step 3: After your content is added successfully, scroll down your mouse, you will see Page Options. You can configure each tab on Page Options making your page nicer and more eye-catching. Step 4: All are done, click Publish to save your configuration. 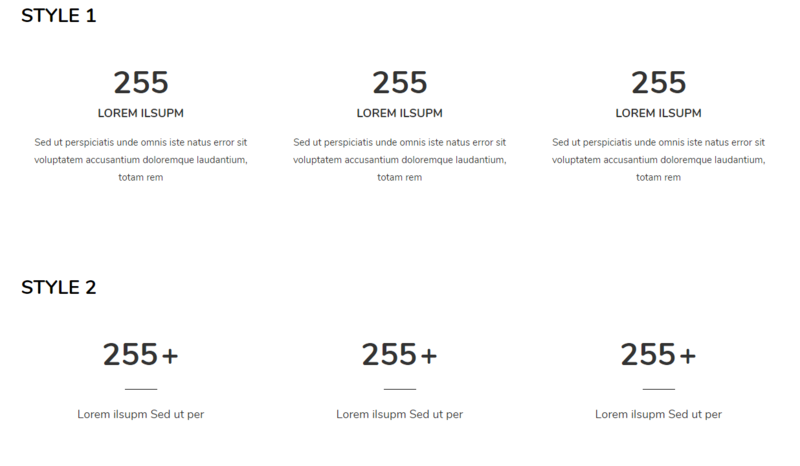 Layout Style: Choose layout style for your page including Default, Boxed, Wide and Float. 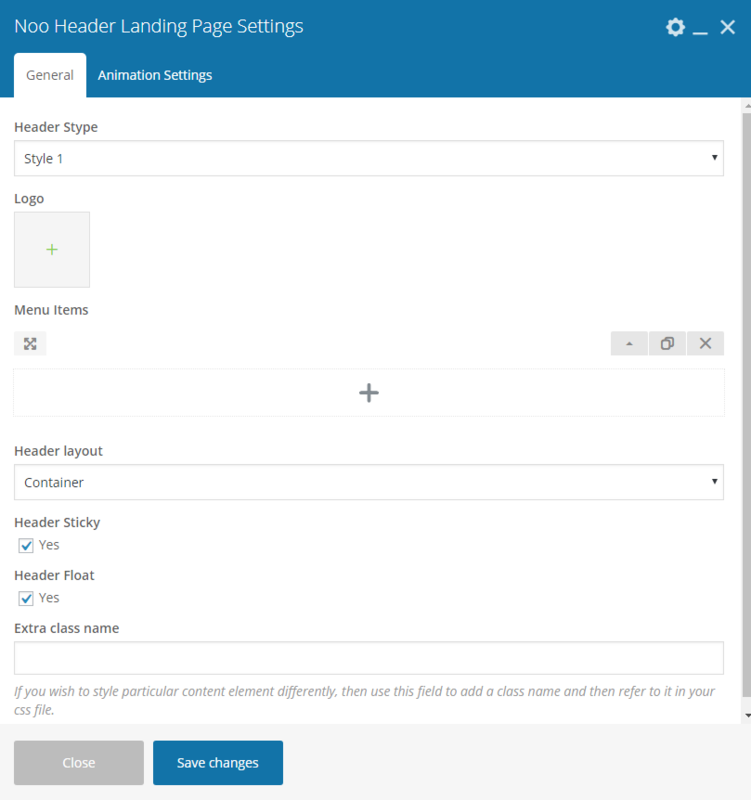 If choose Default, your page will get the configuration on Theme Options. 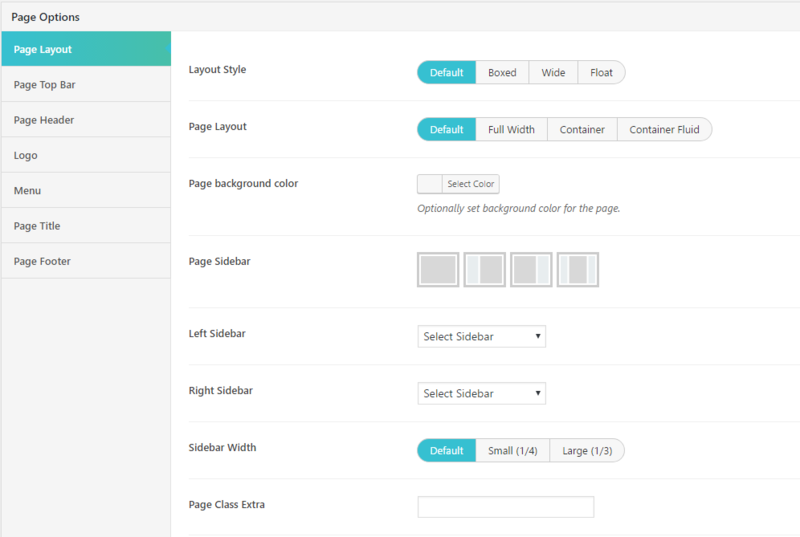 Page Layout: Choose page layout (this section doesn't include header) including Default, Full Width, Container and Container Fluid. Page background color: Set background color for your page from color table. Page Sidebar: Choose sidebar position for page. Left Sidebar:Choose left sidebar for page. This option will appear if you select Page Sidebar: Left Sidebar or Page Sidebar: Left & Right Sidebar. Right Sidebar: Choose right sidebar for page. This option will appear if you select Page Sidebar: Right Sidebar or Page Sidebar: Left & Right Sidebar. Sidebar Width: Choose the width of sidebar. Page Class Extra: Enter page class here. Show/Hide Top Bar: Turn On/Off top bar for you page. If choose Default, the configuration of top bar will be inherited on Theme Options. 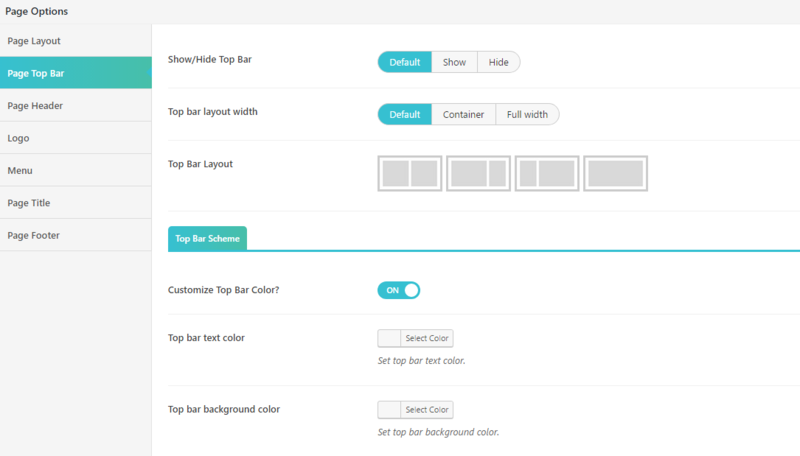 Top bar layout width: Choose the width for your top bar including Default, Container and Full width. 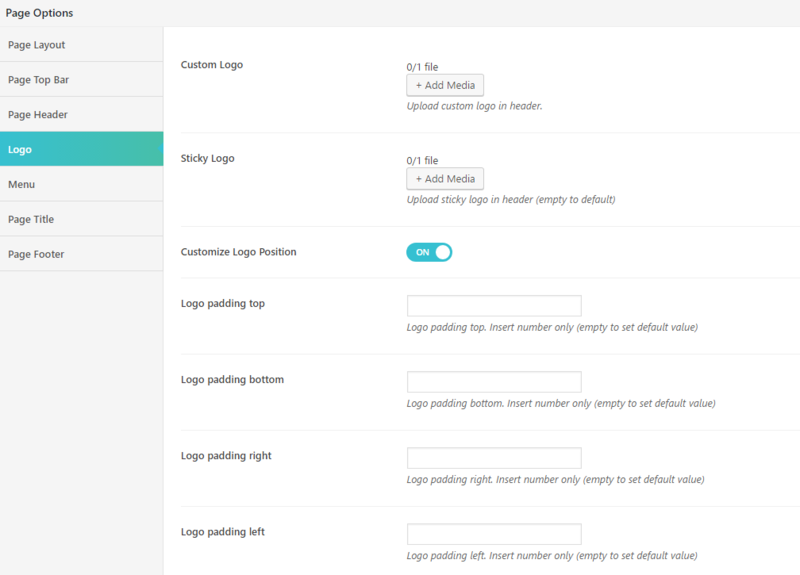 If choose Default, the configuration of top bar layout width will be inherited on Theme Options. Top Bar Layout: Choose top bar layout for your page. Customize Top Bar Color? : On/Off Customize Top Bar color. Top bar text color: Select color for top bar text. Top bar background color: Select color for top bar background. Header On/Off? : Switch header ON or OFF? Custom Logo: Upload your custom logo on header of your page. Sticky Logo: Upload an image for sticky logo. Customize Logo Position: On/Off the custom Logo position. Logo padding top(bottom, right, left):Logo padding top(bottom, right, left). Insert number only (empty to set default value). Menu section will help you to choose separated menu for page. You can select Page Menu and Page menu mobile. 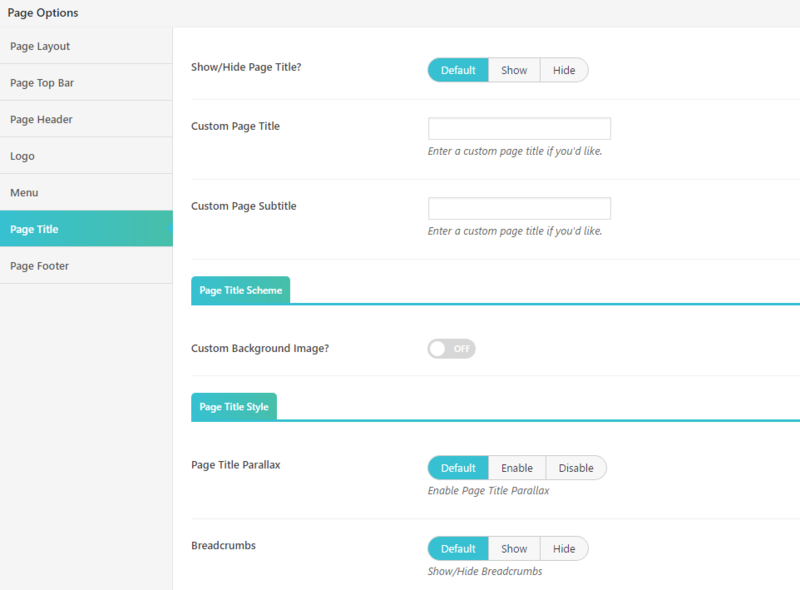 On this section, you can customize your page title with many options such as turn on/off page title, select color for page title or sub title from table color. 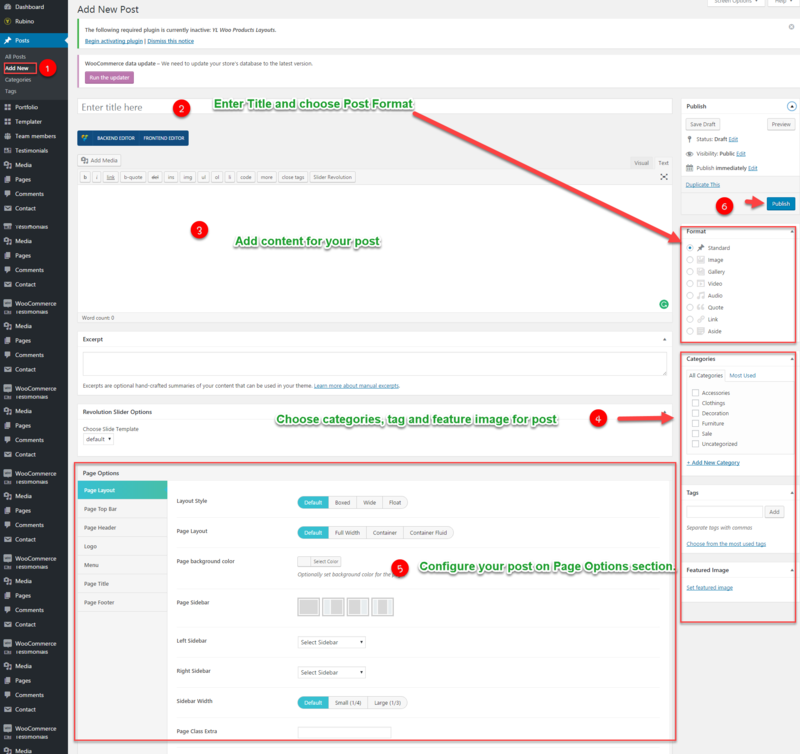 Step 2: Enter your title and choose Post Format from Format box on the right side which shows different post format options: Standard, Image, Gallery and Video. Step 3: Add your post content in editing field. You can use our shortcodes to build your content where needed. . Step 4: Add Categories for the post from the Categories box on the right side. You can add new category or choose from existing categories. Check the box to select Categories for your post. 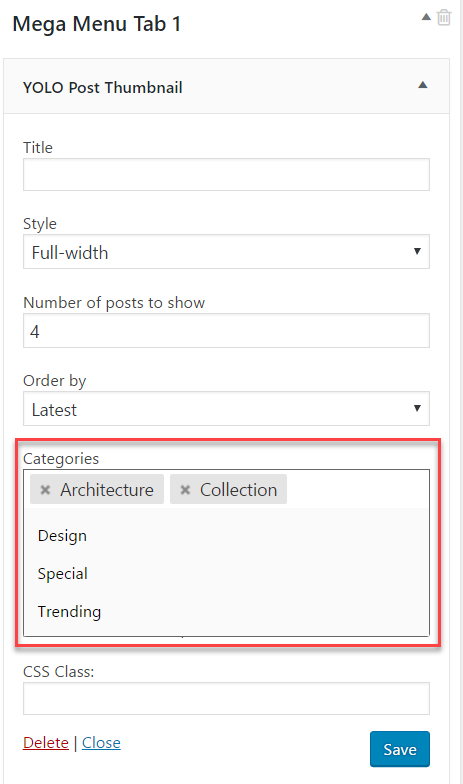 Add relevant Tags for your post in the Tags box, set Featured image on the right side and other settings from the sections below Editing field. If you need more detailed guides about post settings in WordPress, please find in WordPress Codex. 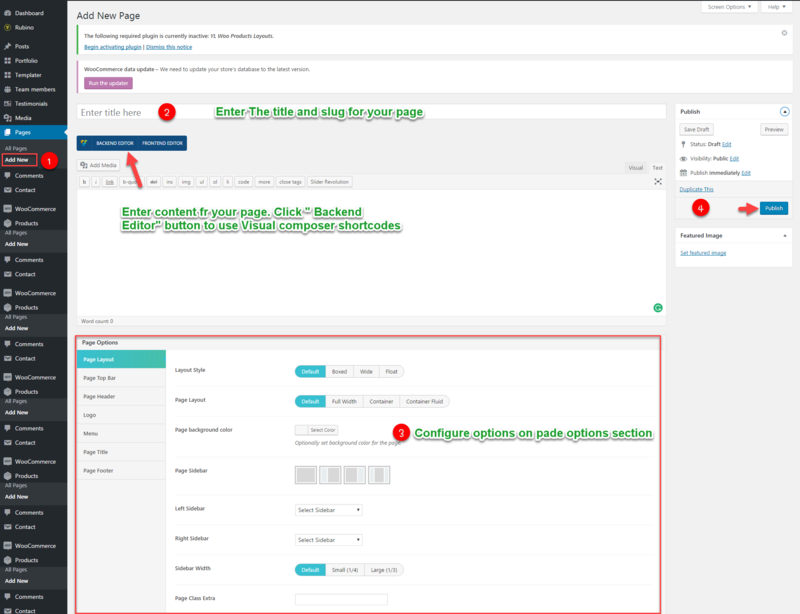 Step 5: After your content is added, scroll down your mouse, you will see Page Options section allowing you to have more configurations for your post. Step 6: All are done, click Publish to publish your post. Palazzo supports 7 post formats. Follow these steps below to see the description of Post Formats and Global setting of Post. Standard Settings: This is the standard post, on this post format, you can choose Featured Image and set the content for it. Gallery Settings: When selecting Gallery Format, you will have Gallery Setting meta-box to add as many images as you want to your gallery and manage your preview content as Featured Image, First Image on Gallery or Image Slideshow. Image Settings: When you selecting Image Format for you post, you will have Image Settings a meta-box to choose a main image of the post. Set Feature Image as the main image for preview content or Choose Your Image if you want to set another image as the main image for preview content. Video Settings: When selecting Video Format, you will have Video Setting meta-box where you can add video URL, and embedded video code, aspect ratio, and preview content as Featured Image, Video or Featured Image as Video Thumbnail. Audio Settings: When selecting Audio Format, you will have Audio Setting meta-box where you can add embedded audio code, aspect ratio and preview content as Featured Image, Video or Featured Image as Video Thumbnail. Quote Settings: When selecting Quote Format, you will have Quote Setting meta-box where you can add the quote and citation and manage your preview content as Featured Image. Link Settings: When selecting Link Format, you will have Link Setting meta-box where you can add the URL, Text and manage your preview content as Featured Image. Like Page Options section of Page, you absolutely configure more options on Page Options of Post. To learn more about descriptions of each option, please visit Page section. Step 2: In the right side, select Team Categories and Featured Image for team member. Step 3: Fill out all information of Team Member Information, Social Profiles, Specialty and Certificates for your Team Member. Step 4: All done, click “Publish” to save the configuration. Team Member Information: Enter all information of Team Member as Image, name, position, phone, email and experience. Social Profiles:Enter your link social here. Leave blank if you don’t show Social for your Team Member. Specialty:Enter the description for your Team member specialty. Certificates:Enter the description for your Team member certificates. Step 2: Enter testimonial title and description. Step 3: Select testimonial categories and add Featured Image on the right side. Step 4: Scroll down, you will see Testimonial Information section. Enter testimonial information here. Step 5: All are done, click Publish to save your configuration. Special: Enter testimonial special here. Rating: Choose rating for testimonial. Background Image: Choose background image for testimonial. Step 2: Enter IDX page title and description. Step 3: Add IDX Data Filter, Select Revolution slider Options and Featured Image on the right side. Footer Blocks custom post type will help you create particular footer style by using Visual Composer shortcode. You can install our sample data learn more about this. Step 2:Adding the content by using Visual Composer shortcode. Step 3:All done, click Publish to save your configuration. When WooCommerce plugin is installed in your WordPress website successfully, you are able to create online shop or product list page. Below is the guide to create Product or shop page using WooCommerce. Step 2: Click Add New to make a new product. 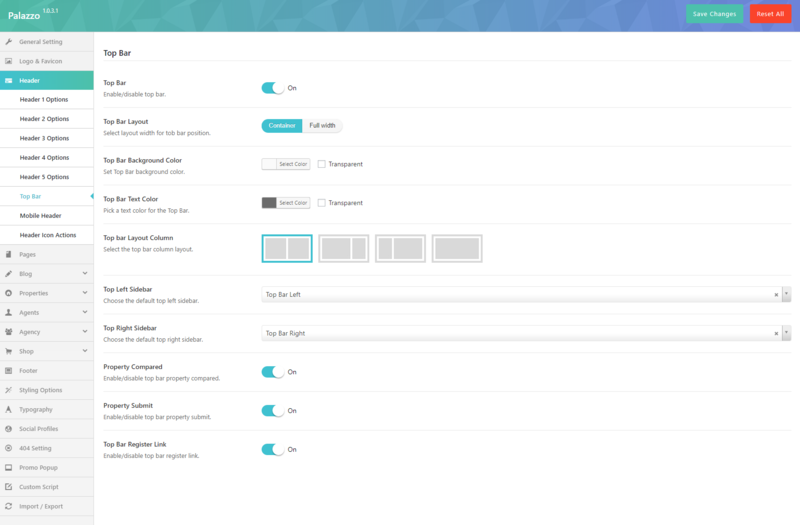 Create a title, and insert your product content in the editing field. 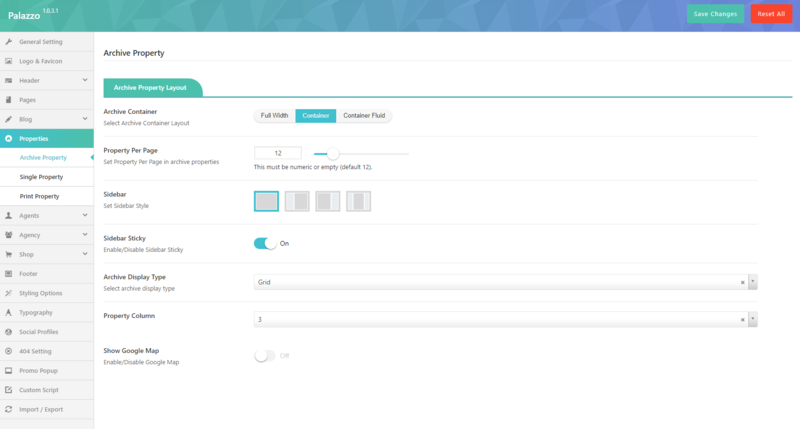 You can use any of our shortcode builder elements inside the product. Step 6: Scroll down your mouse, you will see Product Data option. Remember to choose Product Data: Simple product. Step 7: Once you have finished, click “Publish” to save your product. In Products tab, navigate to Display sub-tab on the top, here you can find your page from dropdown list to set as Shop page. 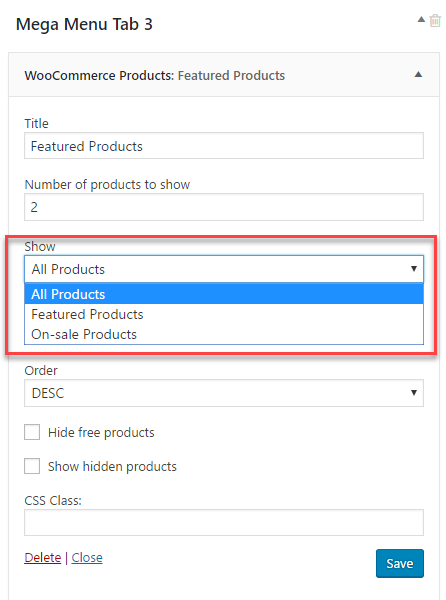 To set up a page as Product List page to show all products such as product list 2 columns, 3 columns, you can create a new page. Then, use Noo Product shortcode and configure options on this shortcode. This shortcode will help you to create Product list page. 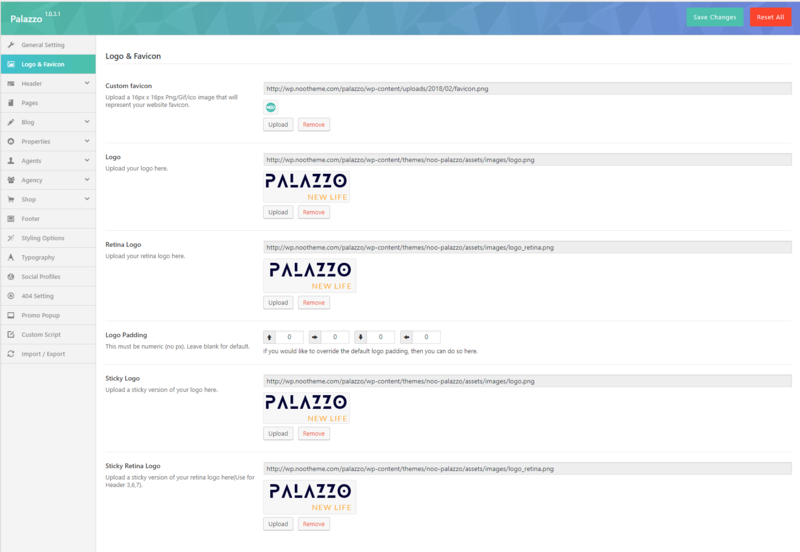 Instead of writing lines of code to build elements, we built Palazzo with number of premade shortcodes that enable you to create many elements you see in our demo in fingertips. 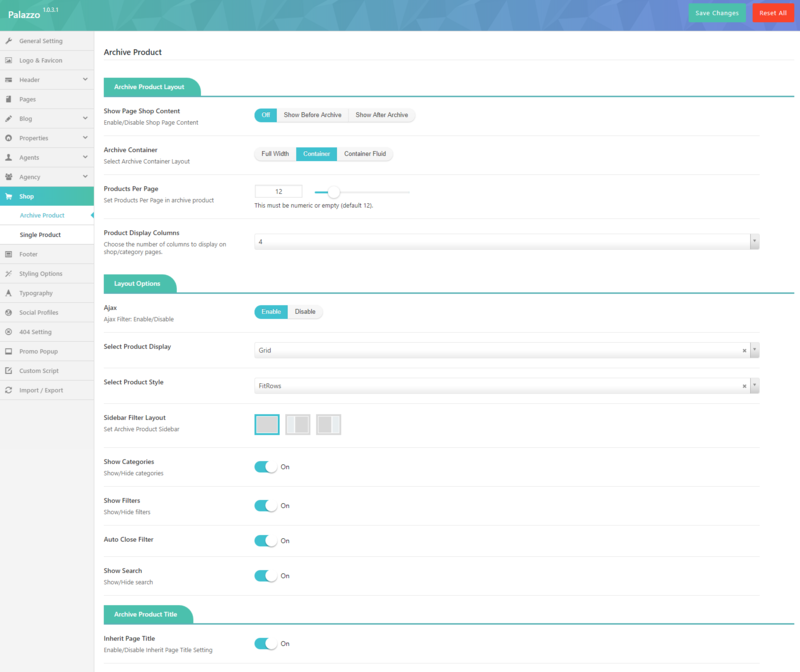 By installing Visual Composer (the page builder plugin is integrated in the theme package), you will have the Visual Backend Editor where every shortcodes are displayed visually and easily generated with several clicks. 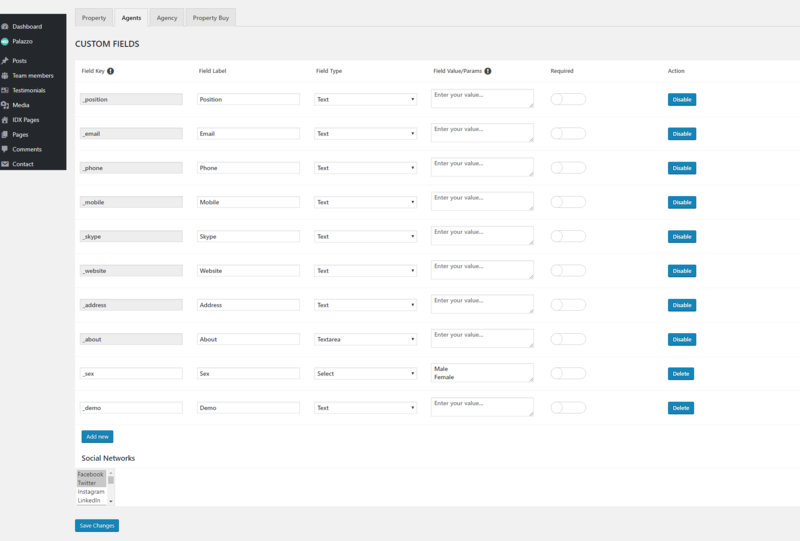 In addition to Default Visual Composer shortcodes, Palazzo comes with 20 specific shortcodes. To generate these shortcodes, go to Backend Editor, click the “+” icon to add shortcode. 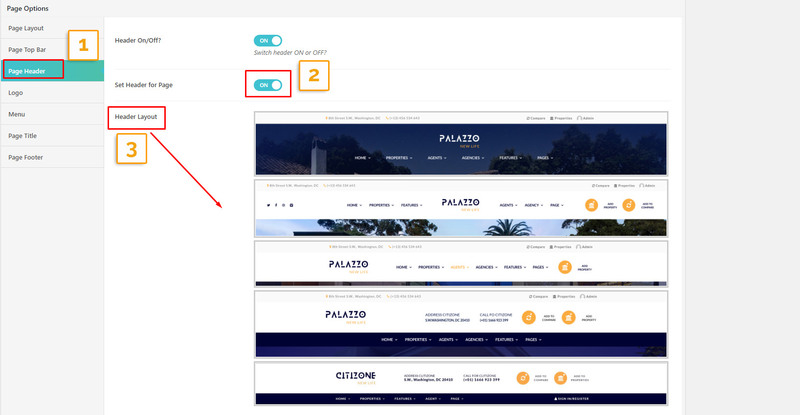 Navigate to Palazzo Shortcodes to find a shortcode you want to use. You can add those shortcodes to any pages or posts for your own use. Use this shortcode will help you to build a blog page such as Blog List, Blog Grid on our demo. Layout Style: Select layout style from drop down list styles for blog page including: List(larger Image), List(Medium Image), Grid, Masonry. Narrow Category: - Select categories of post items displayed on blog page. Total items: Enter number of post which will be displayed on blog page. Display Type: Select display type from dropdown list types . Items per page :Number of items to show per page. Navigation Alignment:Select the position: Center, Left or Right. Extra class name: Enter class name if you want to customize this shortcode. Order By:- select - You can arrange your posts following to different order criteria. Sort Order:- select - Arrange your posts in ascending or descending order regarding to order criteria you set above. CSS Animation:- select - Select types of animation if you want to be animated when it enters into the browsers viewport. Noo Simple Information shortcode will help you to build Portfolio page. Style: Select the style from drop down list (style 1, style 2). Logo: Select the logo for this section. Title: Enter the title that briefly describe the site. Description: Enter the text that describe your business more clearly. CSS Animation:Select types of animation if you want to be animated when it enters into the browsers viewport. Use this shortcode to build testimonial on front page. Source: - select - Choose source from testimonial categories or testimonial IDs. Order Post Date By: - select - Choose the sorting order including Descending or Ascending. Excerpt Length: - number - Enter excerpt length. Auto Play: - Yes/No - Turn On/Off auto play testimonial. Slide Durations: - number - Enter slide durations. Show Nav: - Yes/No - Turn On/Off show Navigation. Show Pagination: - Yes/No - Turn On/Off show pagination. Extra class name: - string - Enter class name to customize this shortcode. CSS Animation: - Yes/No - Select types of animation if you want this element to be animated when it enters into the browsers viewport. Use this shortcode to display recent posts on your page. 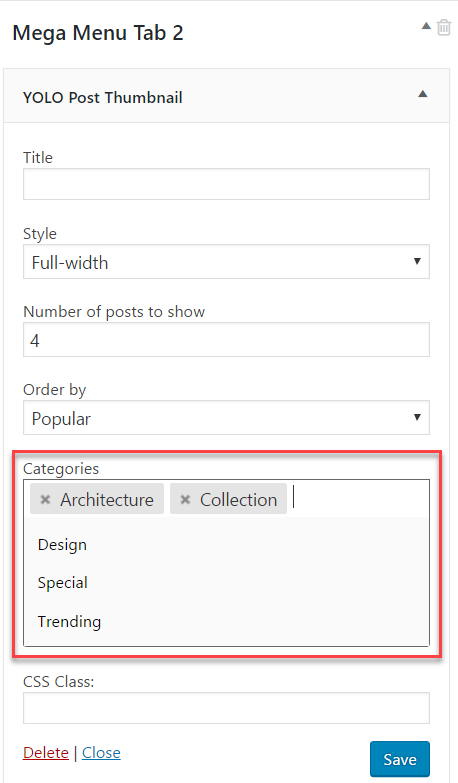 Select Categories: - select - Select categories to display posts on your page. Number of Columns: - select - The column attribute controlling the width of columns should be displayed. Margin: - number - Enter the margin of the recent news section. AutoPlay: - select - Turn On/Off auto play. Show Nav: - select - Turn On/Off show navigation. Show Pagination: - select - Turn On/Off show pagination. Posts Per Page: - number - Enter posts per page. Extra class name: - string - Enter extra class to customize this shortcode. CSS Animation: - select - Select types of animation if you want this element to be animated. Choose layout: - select - Select style layout for countdown shortcode. Use this shortcode to display banner on front page. Country :- Select the country. Layout Style: - select - Select layout style for banner shortcode. There are 2 layout styles you can choose. Column : number - Number column you want to show property. Order by: - select - Select order by date, featured, price, etc. Order: - select - Select order following the recent post or ole posts. Posts Per Page: - number - Enter the number of posts on each page. CSS Animation: - select - Select types of animation for this shortcode. This shortcode will help you to show services on the home page. Layout Style - select - Select layout style for Noo Icon Box from drop down list (style 1, style 2, style 3). Name: - enter - Enter the name of the service here. Content: - string - Enter the content here. Link: - URL - Choose URL when visitors click icon. CSS Animation: - select - Select type of animation if you want this element to be animated when it enters into the browsers viewport. Use this shortcode to display Team Member on front page. 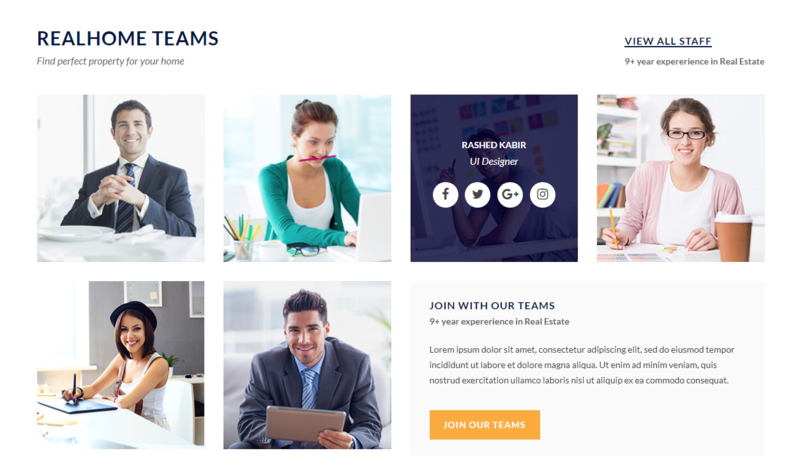 Title: - Set title for the team member section. Title More: - Set title more for the team member section. Sub-Title More: - Set sub-title more for the team member section. Title Extension - Set title extension for the team member section. Sub-Title Extension: - Set sub-title extension for the team member section. Description: - Type the text to describe the agents. Source: - choose - Choose from category or From member IDs. Select Teammember: - select - Select members that will display. You can choose Select All. Use this shortcode to display google maps on front page. Choose style layout: - select - Select style layout for map. Choose style map: - select - Select map style for map. Infor window title: - string - Enter the information in this option. Map height: - number - Enter the height of map. Zoom: - number - Enter zoom here.. Image to replace marker: - image - Select the image to replace the original map marker (optional).. Extra class name: - select - Select font family. CSS Animation: - select - Select types of animation if you want this element to be animated when it enters into the browsers viewport. Sidebar: - select - Select widget area to display. Use this shortcode to show counter on your page. Style: Select style for display statistical. Title: - string - Enter text for counter title. Number: - number - Enter number of statistical. Example 1466. Extra Class name: - string - Enter the class name to custom this shortcode. Use this shortcode displays on your site. Select Category: - select - Select categories that will display on your site. Show Author(Date, Comment, Excerpt): - On/Off - Tick the box some informations that will show/hide them on the post. Posts per page: - number - Choose the number of posts that will be displayed per page.. Extra Class Name: - string - Enter class name if you want to custom this shortcode. Heading: - text - Enter text for heading line. Heading Color: - select - Select the color forthe heading. Subheading: - text - Enter text for subheading line. Background image : -Select image from media library. Background: - Set the video background here. Title : - Enter the title. Description : - Enter the description. Extra class name :- Enter class name if you want to custom this shortcode. Layout Style :- Select layout style including: Grid, List. Image Size :- Setup image size. Total Images Display :- Enter Total images that will display. Number of Column Images :- Setup the column image. Clients :- Enter values for client - name, image and url..
Slider Duration(ms) : Set the duration of the sider. Logo per slide: number logo per slide. Layout Style : Choose the style you love from the drop-down list. 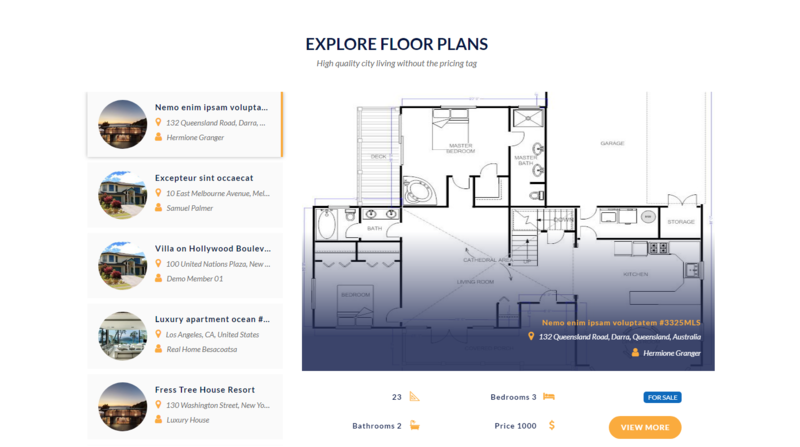 Choose layout style : Select the style of the property listing from the drop-down list. Listing Offers: Select the listing offers type from the drop-down list. Slide Duration: Set the playing time of the slide. Order By: Select Order by option from the drop-down list. Order: Select Order by option from the drop-down list. Posts Per Page: Enter the number of post on each page. Columns: Select the numbers of columns from the drop-down list. Source : Select the source from the drop-down list. Show Map: Select Yes/No to Turn On/Off show map option. 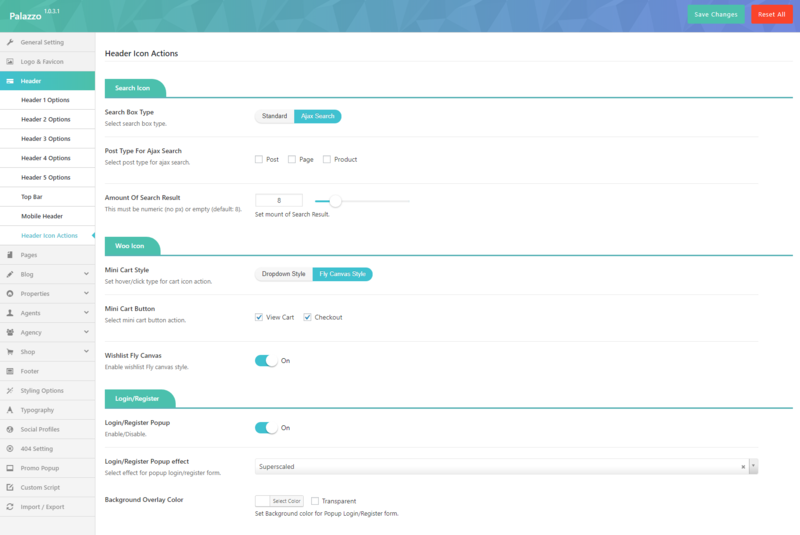 Search Layout: Choose layout for Search form. Zoom: Enter the zoom ratio. Drag Map: Select Yes/No to Turn On/Off drag map option. Automatically Fit all Properties: Select Yes/No to Turn On/Off Automatically Fit all Properties option. Show Features & Amenities: Check the box Yes/ No to turn On/Off Show Features & Amenities. Default Show/Hide Features & Amenities Box: Check the box Yes/ No to turn On/Off Show Default Show/Hide Features & Amenities Box. Text more: Enter More Text. Text Button Search: Enter the Text Button Search. Featured Items: Fill the title, description, URL and Background. Property Item: Set background and enter the Property ID. Select an action: Select the action from the drop-down list. Heading left : Enter the heading left. Heading right: Enter the heading right. Select contact form: Choose previously created contact form from the drop down list. Heading : Enter the heading. Id Form MailChimp: Enter the Id Form MailChimp. Posts Per Page : Insert number of posts per page. Slide Duration (ms): Insert time of slide duration. Excerpt Length: Insert number of words to show in excerpt. Floor Plan Information: Enter the Name and enter numbers of floor, size, Room, Bathrooms, Bedrooms, Parking, Balcony and Thumbnail. Agent : Type the information about the agent. 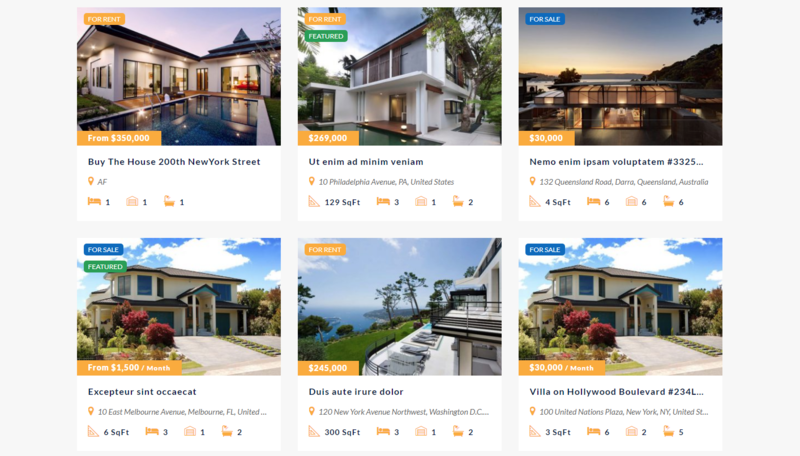 Choose layout style :Select the style of the property listing from the drop-down list. Column: Insert the numbers of column. ID Offers: Select the ID Offers (For Sale/ For Buy). Title : Enter the title. 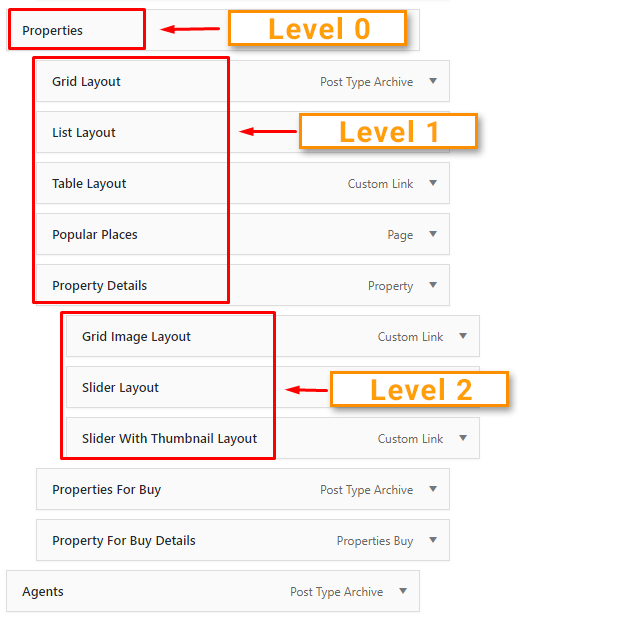 Choose layout style: Select the style of the property listing from the drop-down list. Column: Insert the number of coulumns. Header Type :Select the style of expected header from the drop-down list. Logo: Add the logo of your company. Menu Items: Set up your menu with the content like you wits, for each enter Menu item name and menu item ID. Header Layout: Choose the header layout style you wish from the drop-down list. Header Sticky: Check Yes/No Box. Header Float: Check Yes/No Box. Property ID : Enter the property ID. Palazzo allows you to create an unlimited number of sidebars. Each page or post can come with an unique sidebar. It is really easy to choose a sidebar for page/ post, you can go to Page Options section > Page Layout > Left Sidebar/ Right Sidebar to select a Sidebar from dropdown list on sidebar. You may need to create some separate sidebars to use for different pages and posts. Follow these steps to generate a sidebar and add widgets to it. Step 1: Navigate to Appearance > Widgets > Give a sidebar name, then click Add Sidebar button in the right side. Step 2: All are done, you will have a sidebar position in the right side. 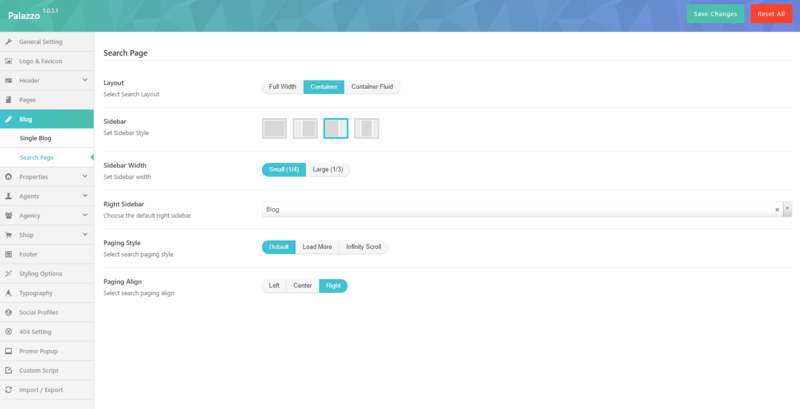 Now, you can add widgets for your sidebar. You can add any widgets and any number of widgets to your sidebar. All widgets are accessible from Appearance> Widgets and easily dragged and dropped to your sidebar. 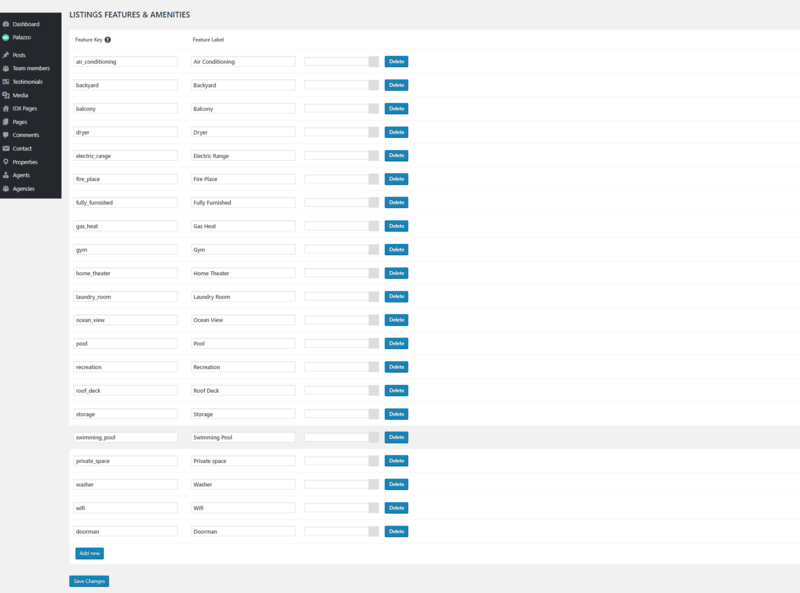 Step 1: Navigate to Appearance > Widgets to get access to the list of widgets and widget section that they can be added. All widgets you can use will be displayed in the left hand side. All different sections you can add widgets to will be displayed in the right hand side. Step 2: Simply drag and drop the widget you want into the widget sections in the right hand side. Step 3: Do not forget to click save changes after you customize any widgets in sidebar. 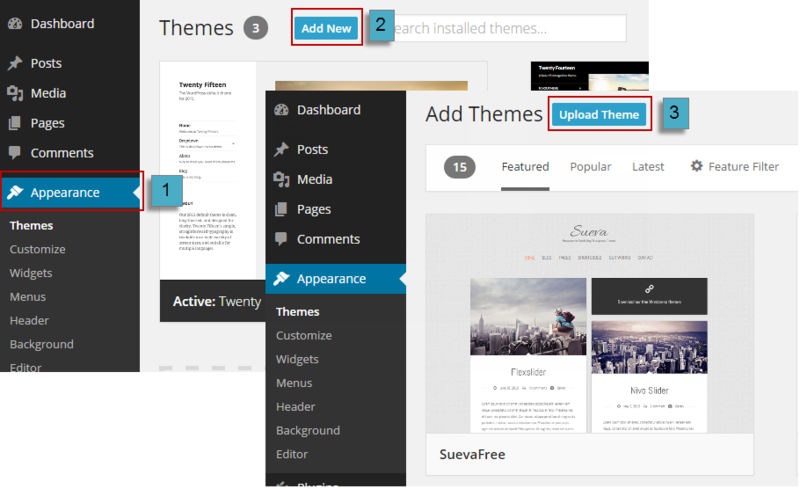 Besides default widgets of WordPress, Palazzo created a lot of widgets which will help you to easily customize your page. Follow these descriptions to learn more about each widget. Use this widget to display instagram on Footer position. Use this widget to display events on Single Event sidebar. Use this widget to display classes on Class List sidebar.. Please make sure that you have installed Contact Form 7 before, then follow these steps to create newsletter page. Step 2: Go to Pages > Add New > Add Contact Form shortcode to your page > Select contact form option. You can choose previously created contact form from the drop down list. 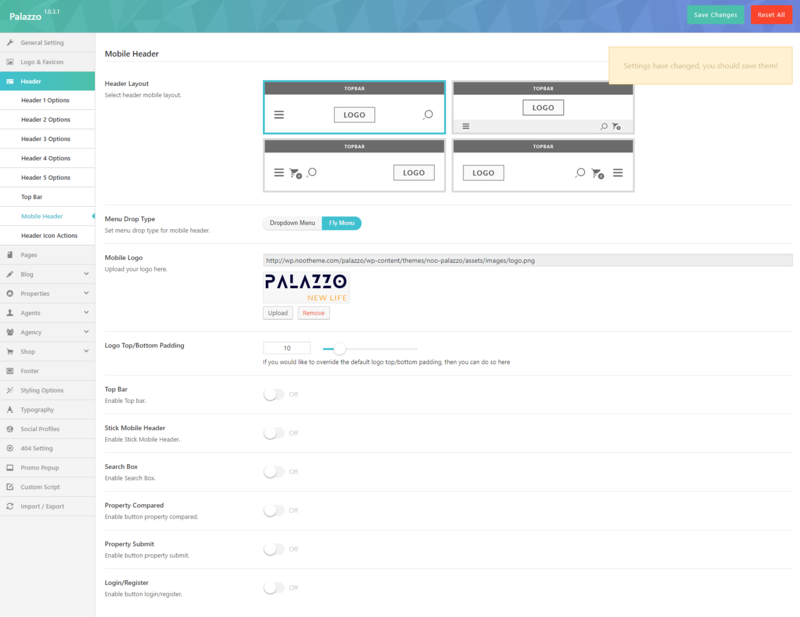 Palazzo supports 4 Newsletter Form Styles for your website. 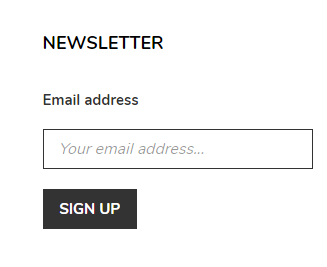 With each Newsletter Form Style, we declare a class. Each class has separate CSS style, you can easily to use one of classes to your website. 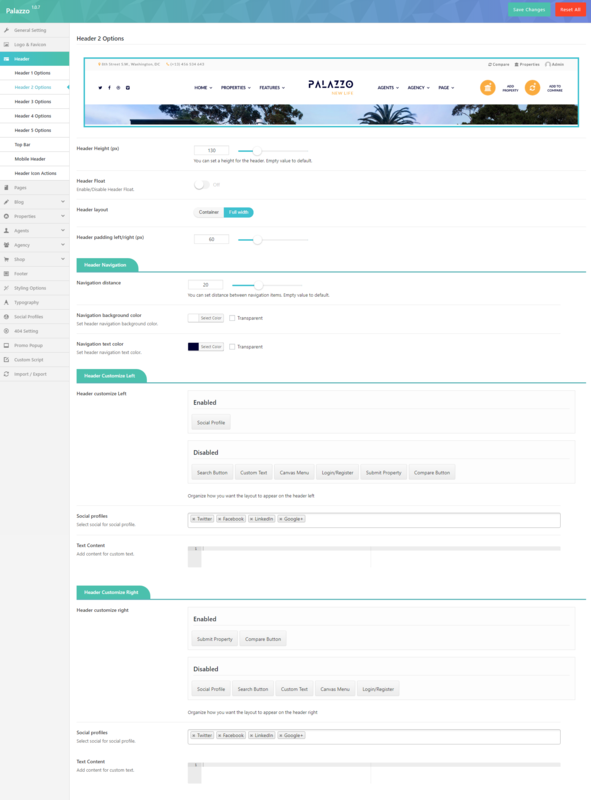 Step 1: From Admin Panel, navigate to Footer Blocks > Add New to create a new footer block. Step 2: Add content to footer block. You can use shortcodes of Visual Composer to add your content as you want. Step 3: Click Publish to save configuration. Step 4: Assign Footer Block to page. 1 - If you want all pages of your website will be received a footer block only: Please go to Theme Options > Footer> Select Footer Block > Choose a footer block from drop down list. 2 - If you want each page of your website will be received a different footer block: Please open your page > Scroll down you will see Page Option section > Page Footer > Select Footer > Choose a footer block from drop down list. If you choose Default style, footer will be overridden on Theme Option. If you have imported our sample demo data, a lot of Footer blocks are available, you can go to Footer Blocks to see all Footer Blocks or edit them. 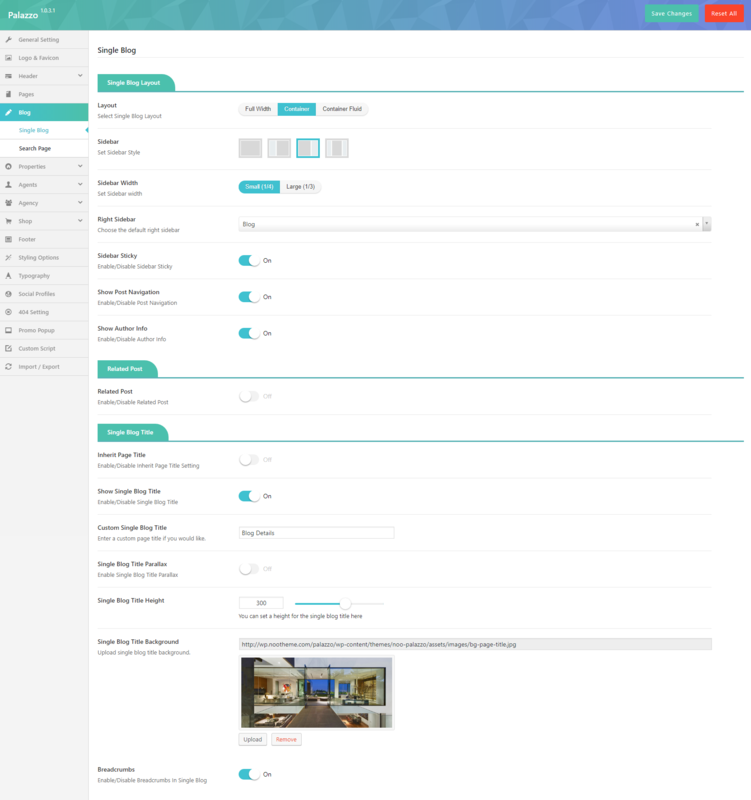 In addition, we used Visual Composer shortcodes to build Footer Blocks. 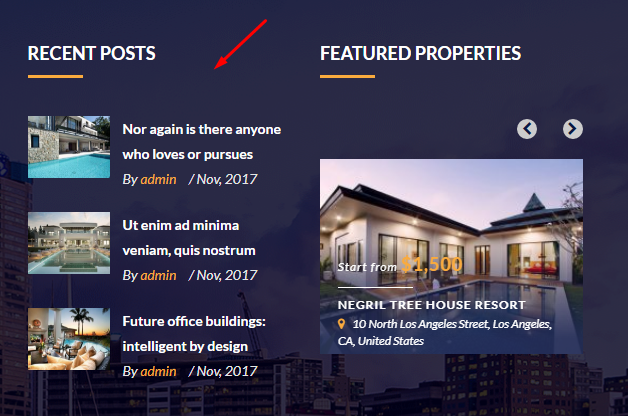 To turn on Visual Composer shortcodes on Footer Blocks, navigate to Visual Composer > Role Manager > Posts type : Custom > Check noo_footer checkbox. 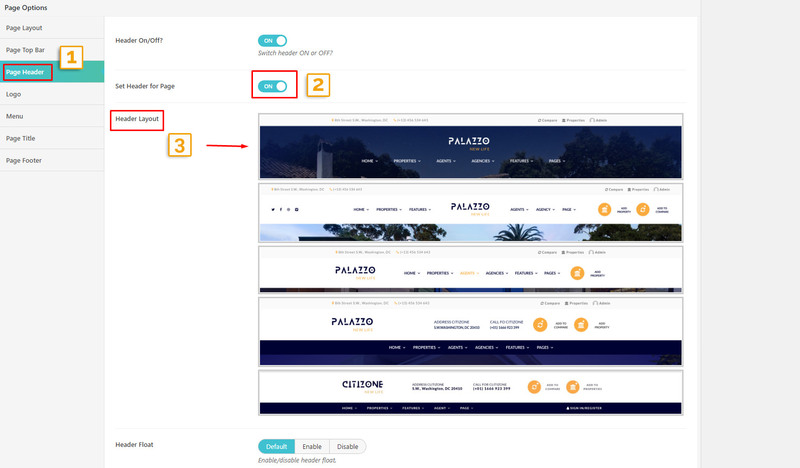 Hopefully, you will enjoy using Palazzo! Thank you for choosing our theme.